As a general rule zoomorphic and anthropomorphic images are far more ubiquitous in global rock art than phytomorphs (plant shapes). Zoomorphs and/or anthropomorphs unambiguously and intimately associated with phytomorphs are most uncommon, while images of zoomorphs and/or anthropomorphs directly physically linked to phytomorphic imagery are even more exceptional. 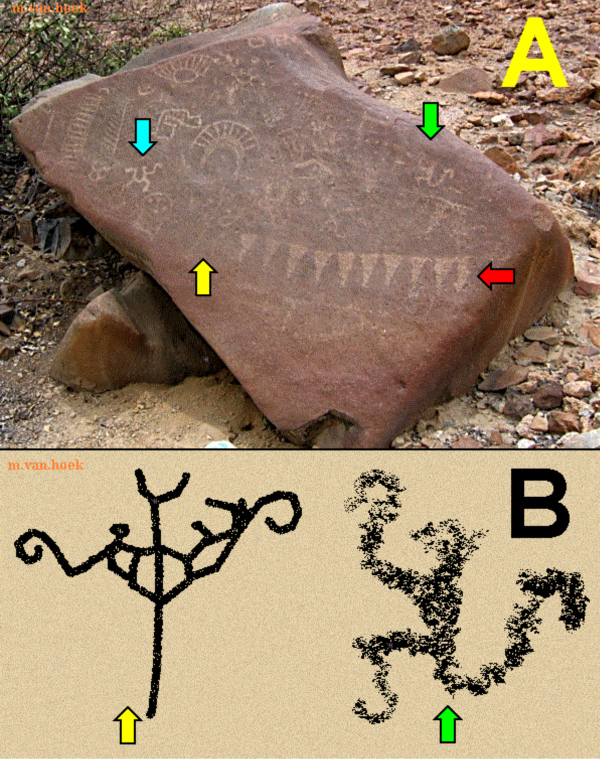 Fine examples of the last group are petroglyphs of birds sitting on trees or plants at the Upper Santa Fe River Canyon site in New Mexico, USA (Slifer 1998: Fig. 76); the petroglyph of an anthropomorph touching a phytomorph from the Galisteo Basin, New Mexico, USA (Slifer 1998: Fig. 95). In the Sahara a few rock painting depict relationships between trees and animals or humans. For instance the rock painting of an anthropomorph touching (or shaking?) a palm tree in the Tadrart Akukas, Lybia (photo by Giorgio Samorini in AARS 2013), or the rock painting of goats eating from a shrub from the Djado Plateau (Lachaud 2014: Fig. 12). Also in the rock art of north-eastern Brazil several images of people apparently worshipping trees have been reported (Campello Magelhães 2011; Justamand 2007; Kestering et al. 2012). In many cases this specific relationship of biomorphs touching, holding (Figure 1A) or climbing (Figure 1B) phytomorphs has been interpreted in terms of fertility. Figure 1A: Rock painting (detail - rotated) from Toca da Entrada do Pajaú, Brazil. Drawing by Maarten van Hoek, based on a photograph by Anne-Marie Pessis and Niède Guidon (2009: 58). B: Rock painting from Morro do Chapéu, Brazil. Drawing by Maarten van Hoek, based on a photograph by Chico Ferreira (2008). Also in the Desert Andes area of South America - our main Study Area - there are several examples, like the petroglyph of a bird sitting on top of a plant-like design (choclo?) at Cajamarca Site 2, northern Peru (Van Hoek 2011b: 41). More ambiguous are the examples of petroglyphs of birds apparently ‘sitting on a pole’ at Arequipa Site 1 in southern Peru. Those ‘poles’ are mainly short, vertical orientated, straight grooves without any further detail. They might symbolise plants, but in this barren desert - an almost treeless and plant-less landscape - this interpretation may well be questionable. However, there is a rock art site in the Desert Andes that has an above average number of petroglyphs that seem to depict biomorphs climbing a very simple phytomorphic design. This - for Desert Andean standards rather isolated but very extensive site - is Palamenco, which is located in the Department of Ancash, northern Peru. Although examples have been reported at other rock art sites in the Desert Andes, the icon of the ‘climbing biomorph’, which constitutes a true hallmark of the rich iconography of Palamenco, is relatively very rare in Andean rock art, albeit overrepresented at Palamenco. The theme of the ‘climbing biomorph’ is the subject of this essay, focussing specifically on Palamenco (PART I) and the Desert Andes (PART II), after which some global examples will be discussed (PART III). Palamenco is a large but isolated petroglyph site located some 760 to 1120 m north of the Lacramarca River, which is part of the Santa drainage in northern Peru. The petroglyph complex, found some 35 km inland, comprises a zigzagging and slightly undulating concatenation of dry valleys, at the most 40 m in width, stretching for about 750 m roughly from the SE (at 655 m O.D.) to the NW (at 659 m O.D.). Importantly, this concatenation of petroglyph clusters is completely invisible from the valley of the Lacramarca River (valley floor opposite Palamenco at 600 m O.D.) as it is separated from it by a low ridge of red hills (its flat-topped summit at 662 m O.D.) running east-west for 4.3 km. Roughly 3 km north of the site low mountains reach a maximum height of 1235 m. For those reasons the views from the site are extremely limited. Only from the NW end of the chain of hills one has some more extensive but still limited views across a small plain with sporadic glimpses of the Lacramarca Valley further south. Having surveyed Palamenco in 2008 together with Dr. Lorenzo Samaniego Román of the University of Santa, Chimbote, Ancash, and based on additional information by Núñez Jiménez (1986) I estimate that more than 300 petroglyph boulders (and perhaps more than 5000 images) exist at this site. I will not be surprised if more petroglyph boulders will be discovered at Palamenco (or already have been since 2008). The boulders at Palamenco are of andesite, a green-grey (extrusive) igneous type of stone that over time develops a deep patina that ranges from brown to purple and red. The sizes of the petroglyph boulders vary enormously. There are very small decorated stones, almost flush with ground level, and enormous blocks of stone. Many large stones are decorated on several sides. What is also significant is that in most cases the red boulders are set in a very bleak background of almost white sands. This red-white contrast expresses the ancient Andean concept of Yanantin as explained by me earlier (Van Hoek 2015). Moreover, many parts of the concatenation of dry valleys are almost completely bereft of vegetation, which is understandable for a desert. Only some cacti and some bushes, small trees and grasses occur very sporadically. No ceramic fragments or other artefacts were detected during my survey, but Dr. Samaniego showed me two small tombs (which he explained to be from the local Santa Culture) on top of the red hill SW of the site. Palamenco is a very arid and bleak yet quiet and secluded zone. Much of the imagery at Palamenco is very old. One of the most characteristic types of designs at Palamenco belongs to the MSC-Style. This acronym (Van Hoek 2011a) encompasses a limited array of typical Formative Period biomorphic images that have been created by the Manchay, Sechín and Cupisnique cultures of the coastal area of central and northern Peru. This group of MSC-Style petroglyphs may be 2000 to 6000 years old. 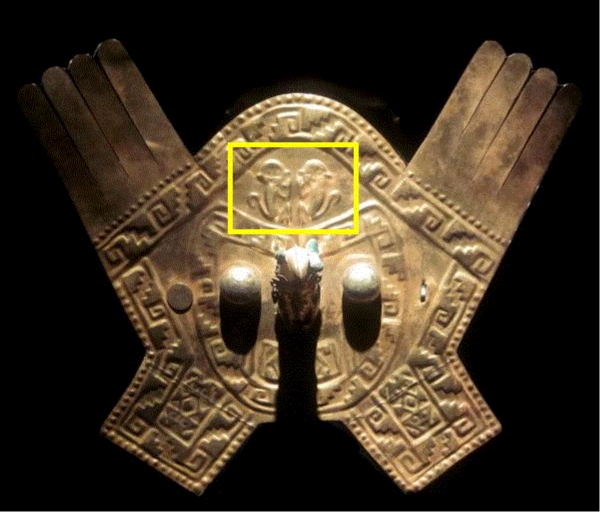 Many other images at Palamenco will be of the same date, although there is no evidence yet to support this claim. Other images will be later and may belong to Salinar, Moche or even later cultures. Again, there is no proof for these suggestions. This also applies to the images that depict the ‘climbing biomorph’ that will be inventoried now. Their age is unknown, but more about that further on. Although Dr. Samaniego explained me in 2008 that a complete inventory of Palamenco would be published by 2011, up to date (September 2015) there still is no officially published inventory of this important site. Therefore, and also because many of the small number-plates placed by the Santa University near most stones have become illegible and because several petroglyph stones did not have such a shield, I have introduced my own numbering system (PAL-001 etc), in which capital letters refer to the panels where necessary (e.g. PAL-051A). 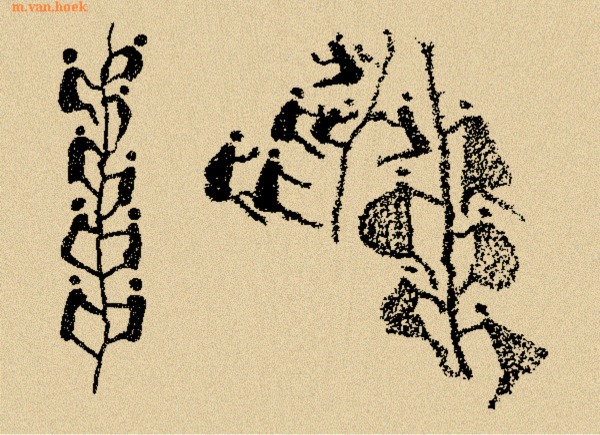 There are at least 25 images (including five doubtful examples) of the ‘climbing biomorph’ at Palamenco, but only three illustrations by Núñez Jiménez (1986) prove to have been correctly interpreted as true ‘climbing biomorphs’. But as many petroglyphs have been severely weathered (some petroglyph panels at Palamenco may even have been obliterated by [intentional, ritual?] hammering) or have been superimposed beyond recognition, there may be more examples than I recorded in 2008. The 25 examples at this site appear on 16 boulders in different contexts. There are a few examples on horizontal upper surfaces and many examples on vertical or sloping panels. The larger the boulder, the more likely it is that the images are in the original position. When on sloping surfaces the biomorphs mainly have been depicted head-up. Only in one case the biomorph appears in an inverted position on a medium sized boulder (that still may have been disturbed). Many, but definitely not all, of the petroglyphs at Palamenco have been illustrated by Núñez Jiménez (1986), and unfortunately several of his renderings are inaccurate, incomplete and/or incorrect (Van Hoek 2011b: 61-74). When a petroglyph has been illustrated by Núñez Jiménez (1986), some relevant observations will be made when necessary. As I strongly advocate that in every scientific publication only accurate drawings should be published, I will - wherever possible and wherever I find necessary - include (or refer to) previously published renderings by other authors in the hope that incorrect drawings will no longer be re-published or valued. This also applies to the Andean petroglyph scenes outside Palamenco. There are two types of ‘climbing biomorphs’ at Palamenco. Type 1 takes in only fully pecked biomorphs, while the second type - an image drawn in outline - comprises only one example. This Type 2 petroglyph will be discussed at the end of the list. It must be emphasised here that due to their exposed nature and their possibly great age many of the ‘climbing biomorphs’ at Palamenco are very faint. The drawings in this survey (that moreover have been reduced quite a bit) may therefore well be inaccurate or incomplete. In many cases adjoining images on the same panel have been omitted in the drawings. Boulder PAL-012: This large boulder directly overlooks a dry river valley to the east. On its east facing, steeply sloping and heavily decorated smooth surface are several zoomorphs and one very faint set of two biomorphs ‘climbing’ along a vertically orientated, central pole that is forked at the upper end (yellow arrows in Figure 2AB). The fully pecked zoomorphs - characterised by their long spiral-like tails - seem to be ‘sitting’ on a circular extension of the pole, but the right-hand example is dubious. It is therefore uncertain if the ‘climbing biomorphs’ are truly facing each other or the observer. Also, because none of the heads of the Type I biomorphs show any detail whatsoever, it is not certain if such biomorphs are truly facing each other or that they both are looking towards the observer, which certainly is a possibility. On the same panel is a biomorph drawn in a rotated position that might represent a ‘climbing biomorph’ (green arrow in Figure 2A and B). However, there is no pole. A third, similar image is indicated with a blue arrow in Figure 2A. The red arrow in Figure 2A points to another hallmark of the imagery at Palamenco - the ‘saw-motif’ - to which I will briefly return in a different and remote geographical context. Figure 2A: Boulder PAL-012 (Palamenco - Peru). Photograph © by Maarten van Hoek). B:Details of two of the biomorphs on PAL-012. Drawings © by Maarten van Hoek..
Boulder PAL-051: Located in a dry valley is an important complex of petroglyph boulders. On a smooth, horizontal panel of a low, medium-sized boulder (PAL-051A) at least two ‘climbing biomorphs’ occur (Van Hoek 2011b: 67). One is vertically arranged in relation to the eastern edge of the flat boulder. The pole is characteristically forked at the upper end and the biomorph has the typically long spiral-tail. Next to it is a large forked groove with some small appendages (roots?) at its lower end. It is ‘touched’ by a biomorph. Further south on the panel is a horizontally arranged forked pole with a long-tailed biomorph. When viewed from the east it appears to be ‘walking’ rather than ‘climbing’. Although these ‘climbing biomorphs’ occur on a horizontal surface, I still regard both biomorphs to be ‘climbing’. All petroglyphs have been fully pecked. The drawing by Núñez Jiménez is incorrect (Van Hoek 2011b: 67). Remarkably however, Núñez Jiménez offers a much better drawing of the panel, but then he incorrectly claims that the illustrated panel is found at (San Miguel de) Yangastambo (Van Hoek 2011b: 67), a petroglyph site in the Cañete Valley, 515 km to the SE of Palamenco. Boulder PAL-052: Next to Boulder PAL-051 is a large, pyramid-shaped boulder that is decorated on practically every surface. It sloping north facing surface (Panel PAL-052C) has one or two examples of the ‘climbing biomorph’. Importantly, the legs of one biomorph do not seem to touch the vertically orientated, forked pole (A in Figure 3). A little lower is a larger biomorph with a large and distinct, inward turning spiral-tail (B in Figure 3). Although rather ambiguous, this biomorph could be associated with a crudely executed and diagonally orientated forked (?) groove. Both ‘climbing biomorphs’ have been fully pecked. Núñez Jiménez provides a rather inaccurate sketch of this panel (1986: Fig. 1105) and incorrectly lists the boulder as Piedra 134. Figure 3: Panel PAL-052C. Details of the two ‘climbing biomorphs’. Drawing © by Maarten van Hoek. Boulder PAL-053: Opposite PAL-051 and across a small (ceremonial?) space overlooked by the vertical south facing panel of PAL-052 is a boulder of which the decorated horizontal surface seems to have been (ritually?) hammered, simultaneously obliterating several images (on purpose?). The steeply sloping NE facing panel (PAL-053B) has an important collection of images. Below a large S-shaped spiral (yellow arrow in Figure 4A) are two ‘climbing biomorphs’ that are facing each other (Figure 4). One pole seems to be forked; the possibly forked end of the other pole may have been superimposed by the S-shaped spiral. The right-hand biomorph has an inward curling tail. Both ‘climbing biomorphs’ have been fully pecked. Figure 4A: Part of Panel PAL-053B. Photograph © by Maarten van Hoek. B: Details of the two ‘climbing biomorphs’. Drawing © by Maarten van Hoek. .
Boulder PAL-058: On the sloping surface of a medium-sized boulder just south of PAL-053 is one rather clear petroglyph of a forked pole with a ‘climbing biomorph’ with the characteristic curled tail (Figure 5). The whole ensemble has been fully pecked. 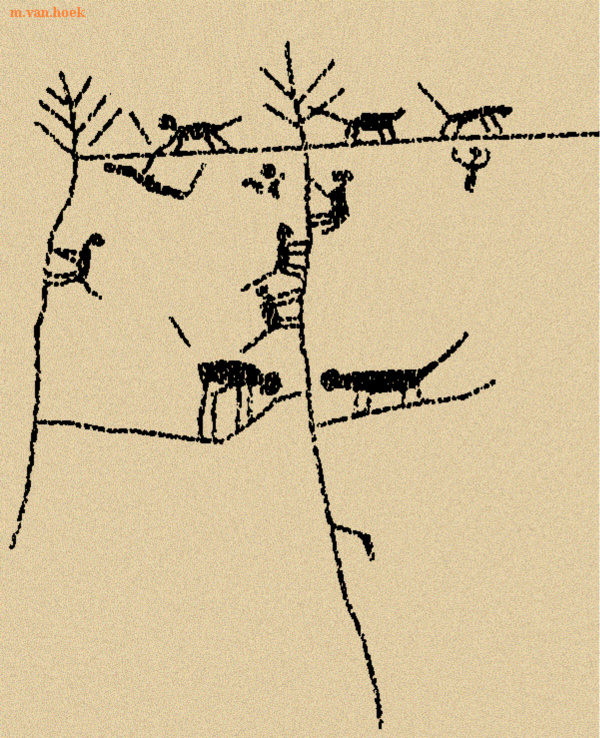 An extremely faint petroglyph to its right (not shown in Figure 5) has erroneously been labelled as a ‘monkey’ by Núñez Jiménez (1986: Fig. 1077). Possibly he referred to the ‘climbing biomorph’. Figure 5: Detail of Boulder PAL-058. Boulder PAL-070A: A large diamond-shaped boulder has a smooth and flat vertical panel (PAL-070A) with several petroglyphs (the drawing by Núñez Jiménez [1986: Fig. 951] is incomplete). From the apex of the stone runs a vertically orientated groove the top of which is forked. Just below the fork sits a small ‘climbing biomorph’ with a long curled tail (A in Figure 6). It is possible that the arms of the biomorph are touching the fork. On the same panel is another biomorph in the typical rotated ‘climbing’ position, yet without being associated with a pole (B in Figure 6). Figure 6: Rough sketch of Panel PAL-070A; much reduced. It must be mentioned here that several zoomorphic petroglyphs in the Desert Andes have been depicted in a rotated position (head up and tail down) as if they are climbing, for instance at Lambayeque Site 1 - Panel r-350A (Van Hoek 2012a: 172-173). Yet in many instances there is no pole. Interestingly, often the lower part of the front leg is pointing vertically up-slope, while the lower part of the hind leg is pointing vertically down-slope. As a result the vertically orientated parts of the two legs seem to suggest a ‘climbing’ action, although several of those images also seem to communicate a ‘praying’, a ‘(flute?) playing’ or an ‘offering’ ritual (Van Hoek 2005: Fig. 20). Boulder PAL-079: This rather large boulder has an unusual, fully pecked ensemble on its vertical surface. It comprises a short, vertical pole, forked at the upper end with a ‘climbing biomorph’ clinging at each side of the pole. 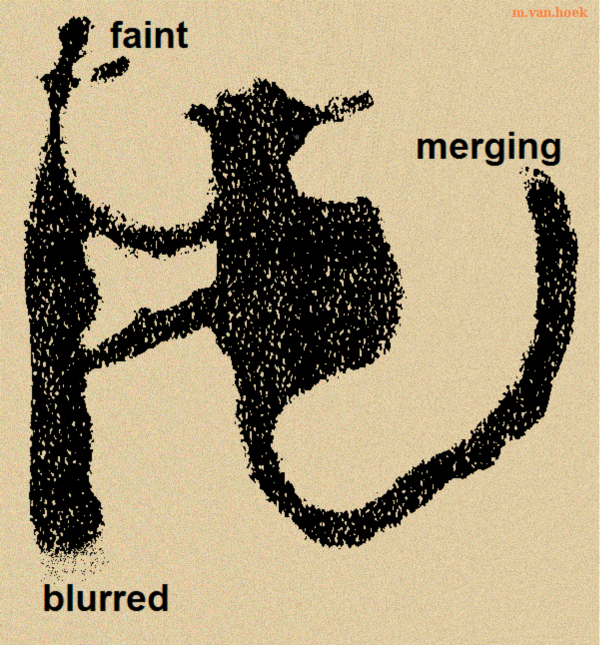 Because no facial features are shown, the two ‘climbing biomorphs’ are either facing each other or the observer (Figure 7). Figure 7: Detail of Boulder PAL-079. Boulder PAL-113: Just east of a very large but low altar-like boulder (that is heavily decorated) is a smaller and irregular boulder with a curious ‘climbing biomorph’ on a steeply sloping surface (Panel PAL-113A). The forked pole is rather long while the ‘climbing biomorph’ seems to have two tails (Figure 8). The whole ensemble has been fully pecked. Also Núñez Jiménez (correctly) illustrates this example. Boulder PAL-120: A medium sized boulder has a number of petroglyphs on its sloping upper surface (Panel PAL-120A). Near the lower edge is a ‘climbing biomorph’ that has been executed in an upside-down position (Figure 9). The pole is irregular and seems to have small appendages at the upper end. The biomorph has the typical spiral-tail and is fully pecked. Figure 8: Detail of Panel PAL-113A. Figure 9: Detail of Panel PAL-120A. Boulder PAL-138: Further east is a medium-sized, low boulder with a number of petroglyphs including a possible ‘climbing biomorph’ on its slightly sloping upper surface (Figure 10). It is a fully pecked biomorph with curled tail attached to a very faint pole. As one can easily observe the ensemble from every standpoint it is uncertain if the biomorph is ‘climbing’ or ‘walking’. Figure 10: Detail of Boulder PAL-138. Boulder PAL-143: A medium sized boulder has a few petroglyphs on its sloping upper surface. 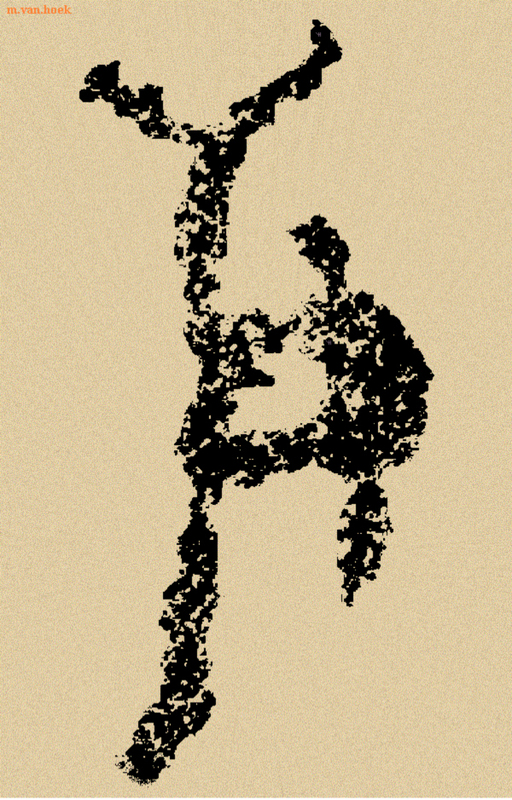 One image depicts a ‘climbing biomorph’ that is attached to a clearly forked pole (Figure 11). The fully pecked biomorph has a long spiral-tail. Interestingly, there are two small pecked rings to the left of the pole; one even attached to the pole. These outlined circles may represent fruit. Figure 11: Detail of Boulder PAL-143. Boulder PAL-148: Unfortunately Núñez Jiménez only illustrates one panel (B) of this medium-sized boulder (1986: Fig. 1118). However, the opposite panel (A) is more interesting regarding this study. 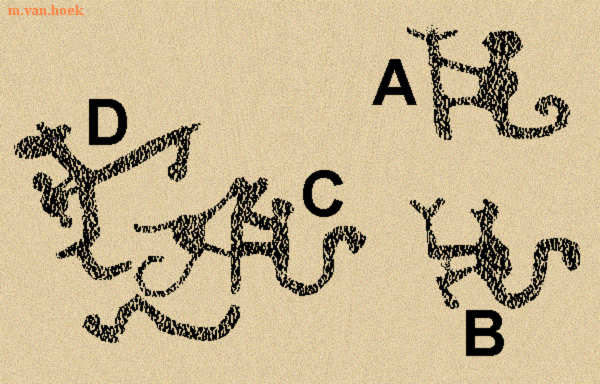 On the steeply sloping surface of Panel PAL-148A are five possibly biomorphic petroglyphs (four shown in Figure 12), two of which definitely represent a ‘climbing biomorph’, while a third and a fourth example are more doubtful. All ‘climbing biomorphs’ are vertically orientated and fully pecked. Biomorph A is attached to a forked pole and has a curled tail. Biomorph B is doubtful as the pole seems to have been unfinished or it was never intended to represent a pole. Example C features a simple forked pole with a more distinct biomorph attached to the right. On the left side of that pole are very faint grooves that might represent a second ‘climbing biomorph’. Example D is a simple biomorph that seems to be attached to a more complex pole. Figure 12: Part of Panel PAL-148A. Boulder PAL-157: On the sloping surface of a medium-sized boulder are two biomorphic petroglyphs (Van Hoek 2011b: 72). 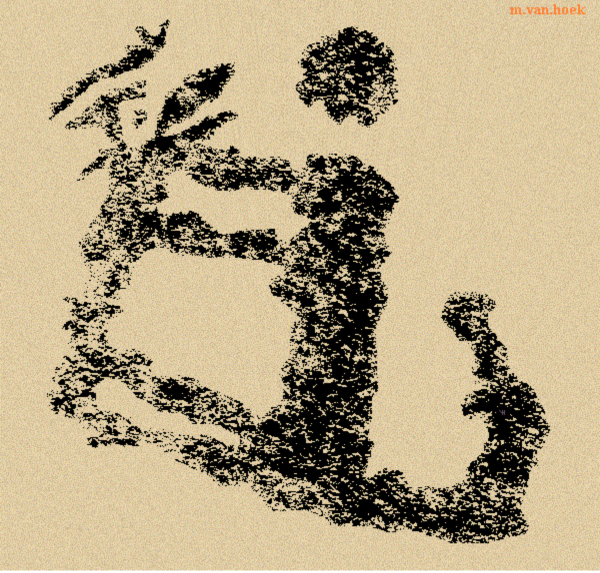 Núñez Jiménez illustrates a third petroglyph that is now almost invisible (Van Hoek 2011b: 72). Unfortunately however he draws the ‘climbing biomorph’ (and other petroglyphs) incorrectly. His rendering looks more like a bird. However, in fact it is a ‘climbing biomorph’ that is connected to a (forked?) pole that has two very faint circles attached to the visible branch of the ‘fork’. Those two ‘circles’ may represent fruit, one of which seems to be eaten by the biomorph that again has a distinct spiral-tail. Apart from the two circles the ensemble is fully pecked. Boulder PAL-166: This medium sized boulder has several images. At its sloping eastern end is a petroglyph of a ‘climbing biomorph’ that is attached to the left-hand side of a forked pole. To the right is a very faint and thus very doubtful second ‘climbing biomorph’. The whole ensemble (Figure 13) is fully pecked. Figure 13: Part of Boulder PAL-166. Boulder PAL-168: Directly north of PAL-166 is another medium sized boulder. On its south sloping surface is a ‘climbing biomorph’ attached to a forked pole (Figure 14). This time the tail seems to be short and straight. The whole ensemble is fully pecked. Figure 14: Detail of Boulder PAL-168. Boulder PAL-126: This small boulder may have a ‘climbing biomorph’ that is positioned near a natural feature that may have been interpreted by the manufacturer as a phytomorph. The fully pecked biomorph has a curled tail and two legs that almost touch a natural rim on the upper surface of the low boulder. This rim has branches giving it a plant-like appearance. Like several other boulders at Palamenco this higher rim seems to have been naturally weathered more than the remaining, lower surface, but it may even have been rubbed intentionally to create a petroglyph (there are more definite examples at Palamenco of this practice described by me earlier: Van Hoek 2012c). However, as a completely anthropic ‘pole’ is missing, this example will not be considered to represent a true ‘climbing biomorph’. Boulder PAL-142: So far all ‘climbing biomorphs’ at Palamenco proved to be fully pecked representations (Type 1). The example on Panel PAL-142B is the only exception as except for the pole and the branch the whole ensemble is executed in outline (disregarding the possibility that it has two outlined legs or four single-line legs). Moreover, it seems to represent a completely different species of animal (a sloth perhaps?). On the vertical south side of a large but low boulder is a ‘climbing biomorph’ with a very short, upwards curving tail (Van Hoek 2011b: 70). Attached to the only branch of the pole are three circles that again seem to represent fruit as the biomorph seems to be eating from one of those ‘circles’. The drawing by Núñez Jiménez (Van Hoek 2011b: Fig. 70) is incomplete and inaccurate (for instance, he draws the hind legs as one fully pecked set). So far I have discussed biomorphs that seem to be climbing a vertically orientated line. However, in the rock art of the Desert Andes there are several examples of ‘walking biomorphs’; biomorphs directly associated with a horizontally orientated line. A boulder at Tacna Site 1 (Boulder N-046) in the south of Peru shows a row of five anthropomorphs that seems to be standing or walking on a horizontal, slightly undulating line (Van Hoek 2012b: Fig. 142). In northern Chile is a petroglyph boulder (Chile Site 1 - Panels 071B-C) with a scene of four anthropomorphs that are ‘walking’ on a thin, horizontally arranged, slightly undulating pecked line (Van Hoek 2012b: Fig. 153). Interestingly and uniquely, this row of ‘walking backpackers’ has been executed on two vertical panels of the same boulder that are facing each other. In northern Peru is a painted zoomorph with curled tail that is hovering over a horizontal line. Another rock painting site in northern Peru has two scenes of anthropomorphs ‘walking’ in a row on a slightly sloping painted line, as well as two confronting zoomorphs (each with a curled tail) and a possible anthropomorph, all positioned on one horizontal painted line. Another more distant example of ‘walking biomorphs’ is found across the Atlantic Ocean at Bushman Kloof in Southern Africa. A San rock painting from Bushman Kloof, Southern Africa shows ten biomorphs (distorted humans or therianthropes?) with elongated legs that are ‘walking’ a thickly painted zigzag line in two directions. La Libertad Site 1: NW of Palamenco - at La Libertad Site 1 - is a large boulder with a petroglyph of a zoomorph on its steep, south facing surface (La Libertad Site 1 - Panel 1-002B). The outlined zoomorph has a typical triangular body (Figure 15A). This biomorph (incorrectly depicted by Núñez Jiménez) is positioned on a short, horizontally orientated groove. As the boulder is too big to have been disturbed the zoomorph may depict a ‘biomorph walking a line’. Ica Site 2: SE of Palamenco - on Ica Site 2 - Panel S-039A - is a fully pecked zoomorph that is also ‘walking’ on a horizontal groove (Figure 15B). As the petroglyph appears on a vertical part of a large outcrop, it is certain that this is the intended position. Figure 15A: Detail of a petroglyph on La Libertad Site 1 - Panel 1-002B. B: Detail of a petroglyph on Ica Site 2 - Panel S-039A. Also at Palamenco there are some examples of the ‘climbing biomorph’ (for example those executed on [nearly] horizontal surfaces, like PAL-051A) that may as well be interpreted as ‘walking biomorphs’. However, the context of all the other definite examples at Palamenco strongly argues in favour of the ‘climbing biomorph’ interpretation for all examples. Especially the rather uniform shape of the fully pecked biomorphs, the forked nature of most poles and the presence of possible ‘fruit-eaters’ all link the images together. Yet, there is at least one petroglyph in the Desert Andes that is ambiguous in this respect. It occurs at Tacna Site 1, an extensive petroglyph site roughly 1300 km SE of Palamenco. This example brings me to discuss other petroglyph sites in the Desert Andes where ‘climbing biomorphs’ have been recorded. Tacna Site 1: Like Palamenco, Tacna Site 1 is an extensive petroglyph site comprising boulders only. The major concentration, comprising a boulder field of no less than 16 km2, is situated on a vast and flat Pampa, which is crossed by a deep and mostly dry gorge. Hundreds of petroglyph boulders have been recorded at Tacna Site 1; at both sides of the gorge. Interestingly, the great majority of the ‘climbing biomorphs’ occur in a rather limited area, mainly north of the gorge. The ambiguous scene referred to earlier is found on Tacna Site 1 - Panel N-005A. It concerns a medium-sized boulder that broke into two parts a long time ago. The smaller part is decorated with a serpentine groove. The bigger, much sloping part depicts a unique scene of two phallic anthropomorphs that seem to be carrying a ‘platform’ that is represented by a single (horizontal) groove (Figure 16). On this ‘pedestal’ is a zoomorph with a small circular, fully pecked head and a large spiral-like tail. Jesús Gordillo Begazo (1996: 62) interprets this scene as two anthropomorphs involved in a feline-cult ritual. Although I cannot dispute his plausible ‘feline-cult’ interpretation, I would like to offer an alternative reading that is based on two possible layers of rock art production. Figure 16: The scene on Tacna Site 1 - Panel N-005A. First of all it is remarkable that the anthropomorphs seem to be ‘carrying’ the platform with one of the two appendages (ears?) on their heads; not with their hands, as each figure has only one arm that in each case is held away from the ‘platform’. In my opinion it is possible that the ‘biomorph on its line’ was the first image on this panel. It may well have been intended to depict a ‘climbing biomorph’ or perhaps a ‘walking biomorph’. Although there is no evidence, it is possible that (much?) later the two anthropomorphs were added in order to create a scene of ‘carrying’ a biomorph. I moreover argue that the biomorph could equally represent a monkey or even some other (imaginary) animal with a spiral-like tail. One of the reasons (a second reason will be discussed at Tacna Site 2) to propose this alternative is the fact that only a few meters from Tacna Site 1 - Panel N-005A is another boulder, labelled Tacna Site 1 - Panel N-004 by me. On the very steep slope of this medium sized boulder is a faint but recognisable petroglyph of a ‘climbing biomorph’, again with a distinct spiral-like tail (Figure 17). The ‘climbing biomorph’ apparently has four legs and is much similar to the biomorph on Tacna Site 1 - Panel N-005A. 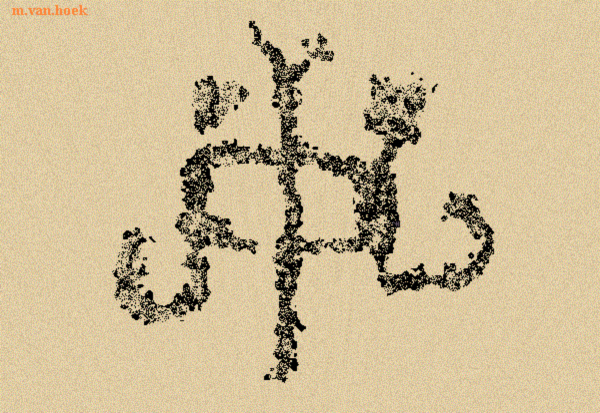 However, in this case the ‘climbing biomorph’ has been executed in an inverted (head-down) position and thus is reminiscent of the petroglyph on PAL-120A. Remarkably, only a very short distance from those two ‘climbing biomorphs’ is a petroglyph boulder that features two horizontal rows of pecked triangles, the so called ‘saw-motif’, which also is a true hallmark of the iconography of Palamenco (see Figures 2A and 6). Actually, after Palamenco with 25 examples, Tacna Site 1 is the second densest concentration of ‘climbing biomorphs’ in the Desert Andes. Altogether, no less than nine examples occur at this site, all found concentrated in a rather small zone. Besides the definite example on Tacna Site 1 - Panel N-004 and the possible example on Tacna Site 1 - Panel N-005A, there is a ‘climbing biomorph’ similar to the one on Tacna Site 1 Panel N-005A on the large boulder of Tacna Site 1 - Panel N-009 (Van Hoek 2011b: 139) and a different example on the medium sized boulder of Tacna Site 1 - Panel N-031, which, however, may have been disturbed (Figure 18). 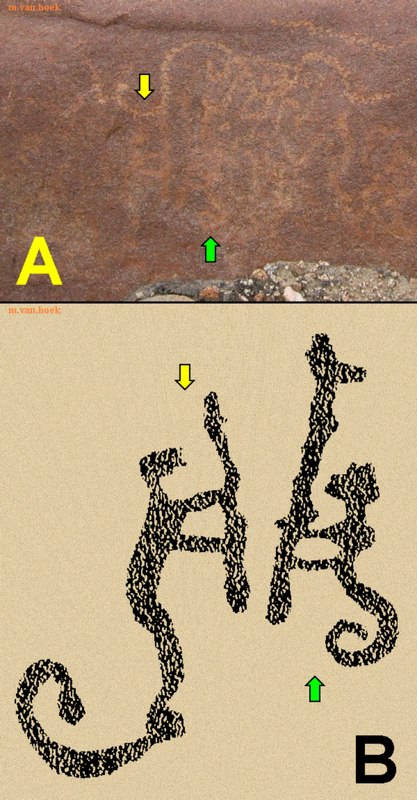 On the almost horizontal upper surface of the small boulder of Tacna Site 1 - Panel N-072 there is a small petroglyph of a ‘climbing biomorph’ measuring only 10 cm, but as one can view the image from every direction it may well represent a ‘walking biomorph’ (Figure 19). Figure 17: Petroglyph on Tacna Site 1 - Panel N-004. Figure 18: Petroglyph on Tacna Site 1 - Panel N-031. A short distance further west is Tacna Site 1 - Panel N-093, a large boulder profusely decorated on all sides. On one of its steep surfaces is a large collection of petroglyphs, including several phytomorphs. 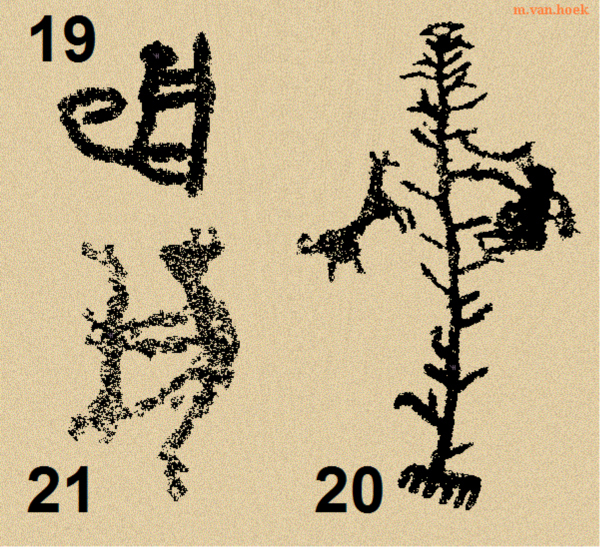 In one case a biomorph seems to be climbing the plant-like petroglyph (Figure 20). Figure 19: Petroglyph on Tacna Site 1 - Panel N-072. Figure 20: Petroglyph on Tacna Site 1 - Panel N-093. Figure 21: Petroglyph on Tacna Site 1 - Panel M-013. South of the gorge only three examples of the ‘climbing biomorph’ have been recorded by me. On the steep slope of a large boulder, Tacna Site 1 - Panel M-013, is a ‘climbing biomorph’ next to a solar or stellar symbol (Figure 21). More interesting is the deeply patinated petroglyph on boulder Tacna Site 1 - Panel M-091, located much further west. It proved to represent two fully pecked ‘climbing biomorphs’ that share the same central pole that is vertically arranged against the slope (Figure 22). Therefore the ensemble looks much like the scene on PAL-079. One of the ‘climbing biomorphs’ has a large, ‘floating’ dot for a head, which is drawn distinctly separated from the body; a practice that is rather common in the iconography of this ‘Tacna’ rock art style (covering the coastal area of northern Chile and southern Peru). ‘Floating’ heads occur in zoomorphic and anthropomorphic petroglyphs of this zone, as well as in its geoglyph art. Figure 22: Petroglyph on Tacna Site 1 - Panel M-091. Tacna Site 2: Significantly, there are a few more sites of the same rock art tradition with examples of the ‘climbing biomorph’. Located in a small, sheltered highland valley is the rock art site of Tacna Site 2. About 400 m west of the main petroglyph concentration are ancient but still used terraced fields called ‘andenes’. On one of the low walls in this field is a medium-sized boulder, Tacna Site 2 - Boulder 002, with faint petroglyphs. It is certain that this boulder is no longer in its original position as it is part of a small heap of field-clearance stones and boulders on one of the low dikes. On the boulder is a serpentine petroglyph and one definite, fully pecked ‘climbing biomorph’ that is attached to a rather thick pole with possibly very short ‘branches’ at the top (Figure 23). Like the example on Tacna Site 1 - Panel M-091 the head ‘floats’ a short distance disconnected from the body. 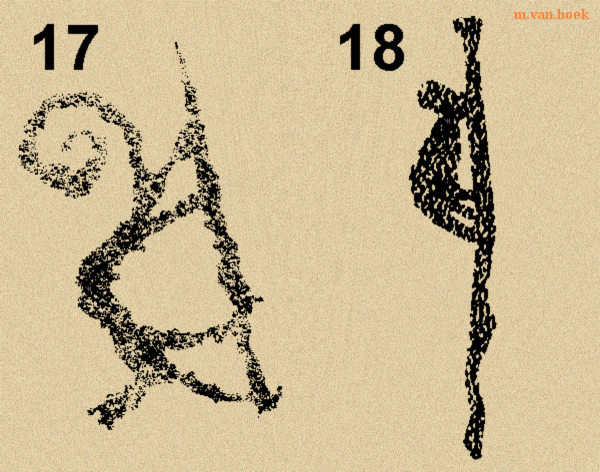 Figure 23: Petroglyph on Tacna Site 2 - Boulder 002; drawn as if ‘climbing’. Why is it almost certain that this scene depicts a ‘climbing biomorph’ and not a ‘walking biomorph’? Because there is rather convincing ‘proof’ nearby. Only a short distance south of Tacna Site 2 - Boulder 002 is a group of very large boulders adjacent to a very small (dry) stream. At the very top of one of those huge boulders, on a much sloping surface, Tacna Site 2 - Panel 006A, are two petroglyphs depicting ‘climbing biomorphs’ that are facing each other (Figure 24). They may be compared with the scene on PAL-053B. Moreover, both poles have a forked top end and each biomorph has a spiral-like tail, similar to examples at Palamenco. Moreover, especially the smaller, left-hand example looks much like the petroglyph on Tacna Site 1 - Panel N-005A, confirming the iconographic and cultural relationship with Tacna Site 1. Their vertical orientation high upon this huge immovable boulder proves that they certainly are ‘climbing biomorphs’. For that reason also the scene on Tacna Site 2 - Boulder 002 most likely depicts a ‘climbing biomorph’ as well. Figure 24: Petroglyphs on Tacna Site 2 - Panel 006A. Tacna Site 3: The rock art site of Tacna Site 3 probably marks the northern limit of the ‘Tacna’ rock art tradition as many petroglyphs in this desert valley clearly belong to the same cultural tradition. One of the boulders, Tacna Site 3 - Boulder 011, is completely covered with petroglyphs. On the sloping side of this rather small and low boulder are two fully pecked ‘climbing biomorphs’ that face each other (Figure 25). Both are rather irregularly executed and merge with nearby images. Therefore it cannot be decided if the tails and poles have been correctly indicated in my drawing. Figure 25: Petroglyphs on Tacna Site 3 - Boulder 011. Drawing by Maarten van Hoek, based on a photograph kindly supplied by Rainer Hostnig (2005). Chile Site 1: The southernmost example of the ‘climbing biomorphs’ - that I know of in the Desert Andes - is found in northern Chile on the steep slopes of a deep river gorge roughly 1450 km SE of Palamenco. This canyon may well indicate the southern limit of the ‘Tacna’ rock art tradition that definitely covers part of northern Chile. On the steeply sloping surface of a large boulder, Chile Site 1 - Boulder 007, are many petroglyphs. 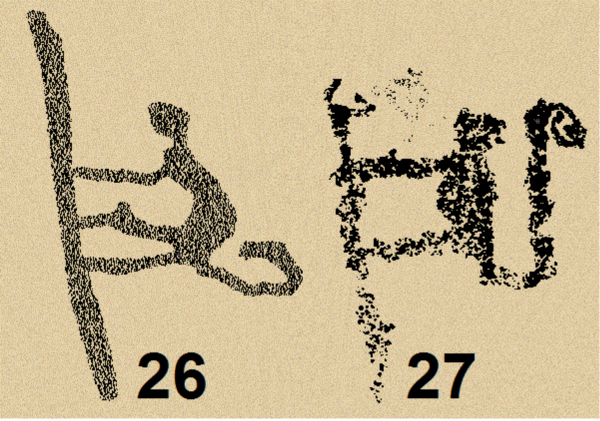 One of these images seems to depict a ‘climbing biomorph’ (Figure 26 - see below). It is fully pecked and although it is rather faint through weathering, it seems to be very similar to the examples at Tacna Site 1. 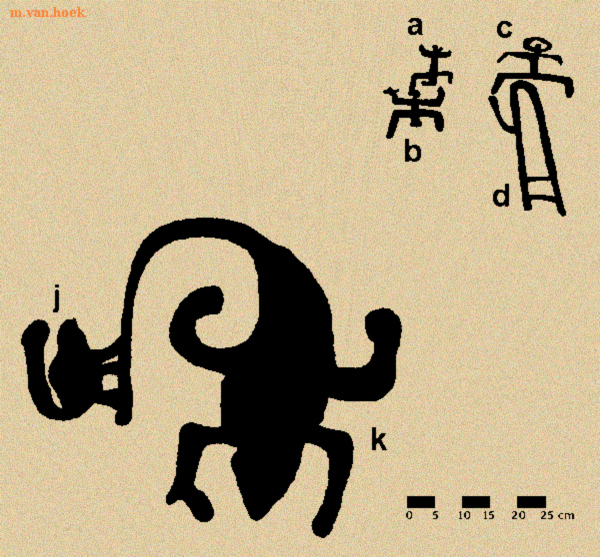 In the same archaeological zone is another boulder with a petroglyph of a possible, four-legged ‘monkey’ in a horizontal, ‘walking’ position, without a pole or line, but with a very distinct spiral-tail (Van Hoek 2012b: Fig. 148). Lima Site 1: North of the ‘Tacna’ rock art tradition zone are a few more sites with possible depictions of the ‘climbing biomorph’. About 450 SE of Palamenco is the important rock art complex of Lima Site 1. Two huge and thus immovable boulders at this site have petroglyphs of ‘climbing biomorphs’. On the steep slope of Lima Site 1 - Boulder 003 is the vertically orientated petroglyph of a slightly tapering pole with a biomorph with distinct ears and a very faint curled-up tail. It seems that the mouth of the biomorph is touching the pole (Van Hoek 2011b: 83 - Detail 4). The ensemble is rather small and possibly for that reason it has not been identified as such by Núñez Jiménez. 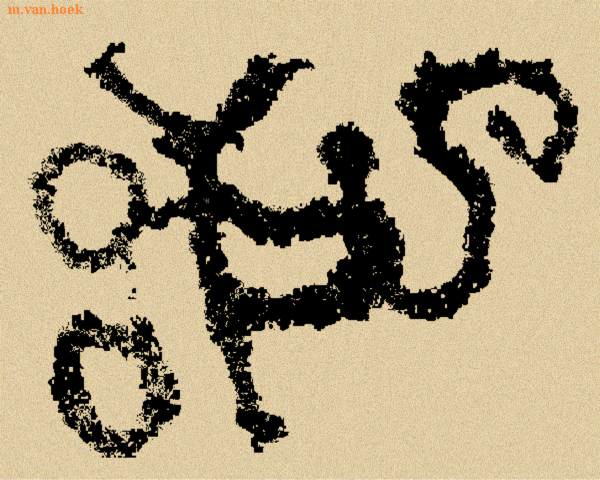 He draws the petroglyph as an amorphous feature that cannot be identified as a ‘climbing biomorph’ (Van Hoek 2011b: 82). Because of the enormous size of the boulder it is certain that the biomorph is vertically arranged. Further north at the same site is another enormous boulder, Lima Site 1 - Boulder 013. On a steep slope facing the river is a diagonal line with two fully pecked ‘climbing’ or ‘walking biomorphs’, not illustrated by Núñez Jiménez. 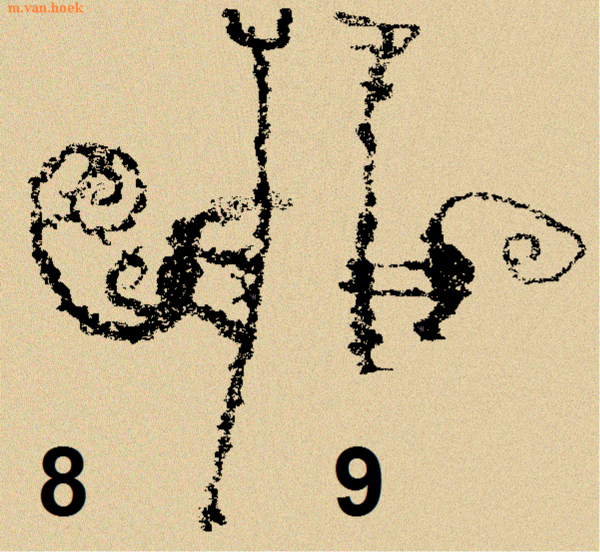 Both have a long curled tail, but their heads are markedly different (Van Hoek 2011b: 84). It may concern two different species of animals. La Libertad Site 2: A short distance NW of Palamenco is an important petroglyph complex, La Libertad Site 2. Carol Patterson, who also surveyed the site, has been so kind to provide me with a photograph of a small rounded boulder, labelled La Libertad Site 2 - Boulder 083 in this survey, on which an isolated image of a ‘climbing biomorph’ appears (Figure 27). As it is on a sloping side and in a vertical position it most likely represents a true ‘climbing biomorph’. The pole may be forked at the upper end while the biomorph has a distinct spiral-like tail. The whole ensemble is fully pecked. Figure 26: Petroglyph on Chile Site 1 - Boulder 007. Drawing by Maarten van Hoek, based on a photograph kindly supplied by Renato Aguirre Bianchi (2001). Figure 27: Petroglyph on La Libertad Site 2 - Boulder 083. Drawing by Maarten van Hoek, based on a photograph kindly supplied by Carol Patterson (2004). La Libertad Site 3: This petroglyph complex is precariously located high up on a very steep, east facing slope of a mountain. The major rock - possibly a very large boulder or an outcrop - has a steeply sloping panel, La Libertad 3 - Panel 004A, which can only be observed from the west, simultaneously overlooking the valley. On this large panel is a confusion of petroglyphs including one example of a ‘climbing biomorph’. The ‘climbing biomorph’ is marked A in Figure 28, while two other petroglyphs have been marked B and C for easy reference. Unfortunately, two earlier scientific publications of this panel offer illustrations in which the ‘climbing biomorph’ cannot be recognised. 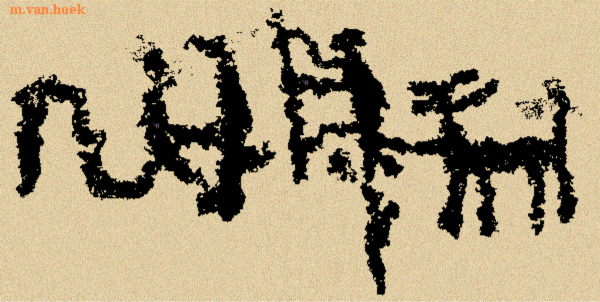 Argentinean archaeologist Ana María Rocchietti published a much distorted and completely illegible drawing (probably based on her Fig. 14a) of part of La Libertad 3 - Panel 004A. 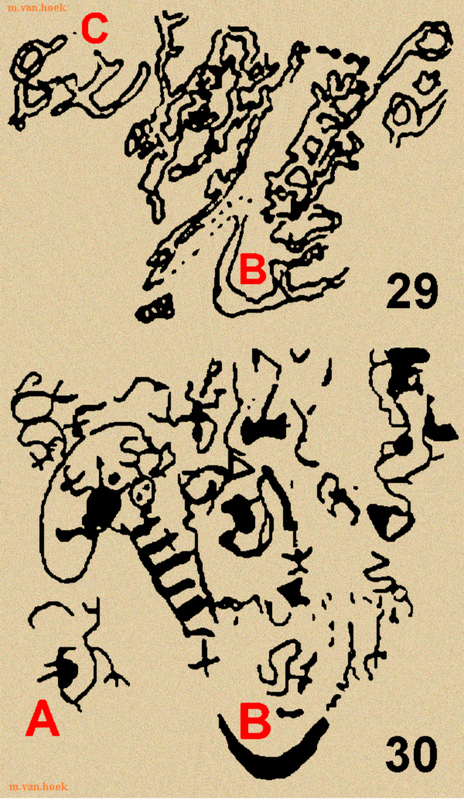 In her drawing (Figure 29) the ‘climbing biomorph’ is situated ‘somewhere’ between petroglyph B and C, but is completely unrecognisable, also because areas of naturally weathered nature have been included as anthropic markings. Moreover, petroglyph B and - except for circles etc - all other markings are not outlined, but fully pecked, which adds to the confusion. 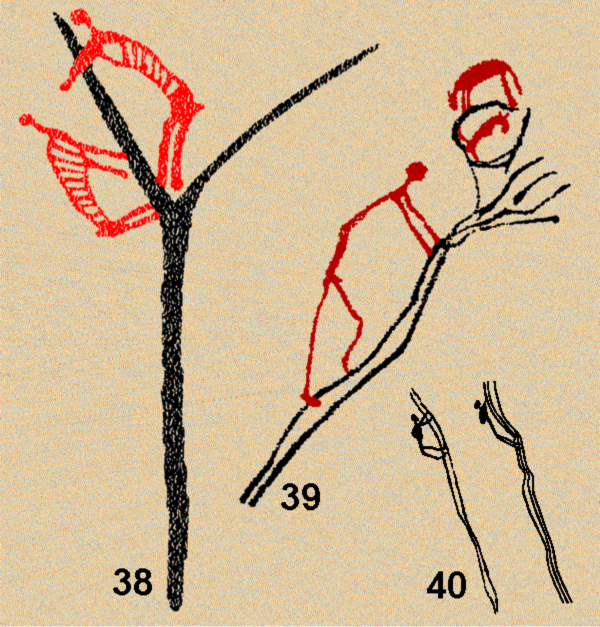 The earlier drawing by Peruvian archaeologist Daniel Castillo Benites (Figure 30) is only slightly better, but strangely he omits the relevant pole of the ‘climbing biomorph’ and incorrectly includes more recent damage as part of the tail. Figure 28: Part of La Libertad 3 - Panel 004A. The ‘climbing biomorph’ is marked A. Photograph by Maarten van Hoek. Figure 29: Part of La Libertad 3 - Panel 004A. The ‘climbing biomorph’ cannot be identified. Drawing by Maarten van Hoek, based on a drawing by Ana María Rocchietti (2012: Fig. 14b). Figure 30: Part of La Libertad 3 - Panel 004A. The ‘climbing biomorph’ is marked A. Drawing by Maarten van Hoek, based on a drawing by Daniel Castillo Benites (2009: Lámina 5, Sector 2). In fact the ‘climbing biomorph’ on La Libertad 3 - Panel 004A is attached head-up to a simple, vertically orientated pole that might have a forked upper end (this part is rather faint). The lower end ends in a severely blurred area and therefore the pole may have been incompletely drawn by me (Figure 31). 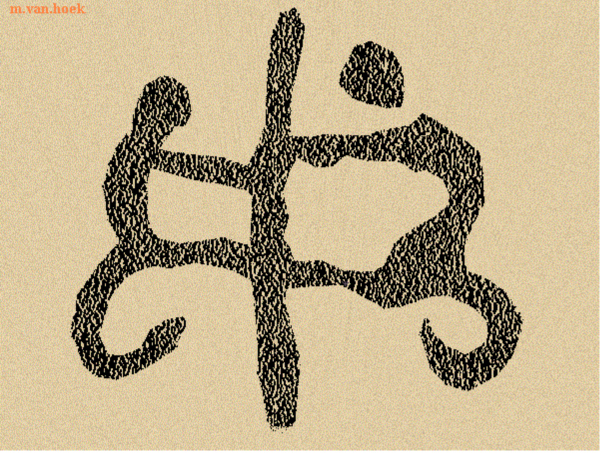 The biomorph has a long upward curling tail - without the characteristic spiral - that merges with another petroglyph. The whole ensemble is fully pecked. In a nearby valley is a very large boulder with a petroglyph of a fully pecked biomorph in a vertical, ‘climbing’ position, without a pole however. Yet this pole may once have existed on the flaked-off parts near its feet (Van Hoek 2014: Fig. 9). Figure 31: The ‘climbing biomorph’ on La Libertad 3 - Panel 004A. Cajamarca Site 1: About 200 km NW of Palamenco is Cajamarca Site 1, one of several petroglyph complexes in this valley featuring MSC-Style imagery from the Formative Period. Cajamarca Site 1 - Panel 003B is the rather steeply sloping upper surface of an enormous boulder that is covered with numerous petroglyphs including one ‘climbing biomorph’ that is attached to the straight and vertically orientated part of a long curving line that only seemingly simultaneously is the tail of a large zoomorph. Remarkably, Victor Pimentel (1986: Fig. 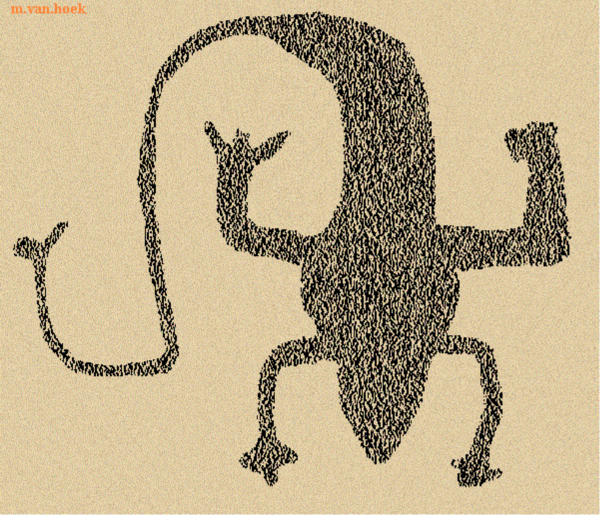 7.3) only draws the big ‘lizard’ (Figure 32) and - incorrectly - the tail of the ‘climbing biomorph,’ but surprisingly does not depict the ‘climbing biomorph’ itself. The size of this ‘climbing biomorph’ cannot be estimated with the scale in the drawing by Edgar Bracamonte Lévano and Ceyra Pasapera Rojas, as their rendering of the relevant part of the large panel (2008: Fig. 4) places the various images at incorrect spots and moreover at clearly different scales. Moreover, there are several faint (often superimposed) petroglyphs on this panel that are not shown in their drawing (Figure 33). 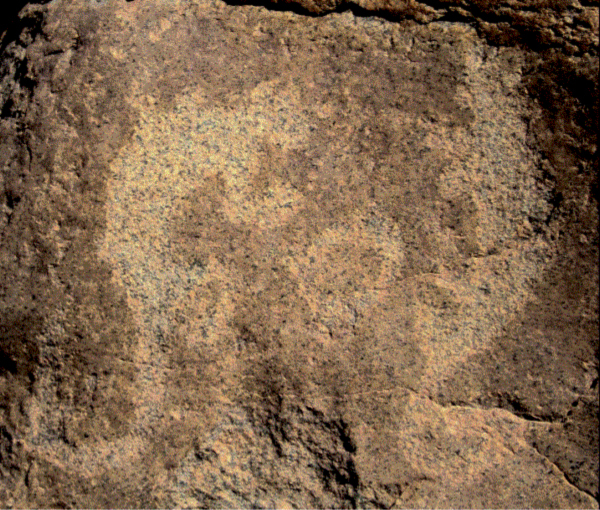 Figure 32: Petroglyph on Cajamarca Site 1 - Panel 003B. Drawing by Maarten van Hoek, based on a drawing by Victor Pimentel (1986). Figure 33: Part of the Cajamarca Site 1 - Panel 003B. Edgar Bracamonte Lévano and Ceyra Pasapera Rojas (2008). Bracamonte Lévano and Ceyra Pasapera Rojas describe the ‘climbing biomorph’ as: ‘una vizcacha elaborada sobre la cola de una lagartija’, which freely translates as: ‘a vizcacha (an Andean rodent) attached to the tail of a lizard’. However as Edgar Bracamonte Lévano and Ceyra Pasapera Rojas draw this panel incompletely and inaccurately, it remains to be seen if indeed the larger biomorph (‘k’ in Figure 34) is indeed a ‘lizard’ that is positioned upside-down (head down). As there are several layers of petroglyph production on this panel (the oldest images at this site may be more than 6000 years old), it is even possible that the ‘climbing biomorph’ originally was attached to a straight pole that later was connected to the ‘lizard’. The ‘climbing biomorph’, which is orientated head-up against the slope, is fully pecked, but the larger ‘lizard’ seems to have been coarsely pecked in outlines with a lighter pecked infill. Figure 34: Part of Cajamarca Site 1 - Panel 003B. Drawing by Maarten van Hoek (much reduced). Lambayeque Site 1: The large concentration of petroglyphs of Lambayeque Site 1 is located some 275 km NW of Palamenco. Among the thousands of deeply red patinated boulders on the south and west slopes of this isolated hill is Lambayeque Site 1 - Boulder g-177. It is a medium sized boulder with a slightly sloping upper surface on which are three petroglyphs including one simple ‘climbing biomorph’ that is fully pecked (Van Hoek 2012a: 92). The pole is very irregular and uncertain in places. As it is possible to observe the ‘climbing biomorph’ from every direction, it is uncertain if indeed the biomorph is ‘climbing’. It may as well have been the intention to depict a ‘walking biomorph’. Bolivia Site 1: Although the vertical poles (sometimes with ‘fruit’) at Palamenco may indeed symbolise plants or trees, factual representations of unambiguous trees associated with animals are extremely rare in the rock art of the Andes. The only definite examples that I know of are found in the Chirapaca area of NW Bolivia. This site, located about 8 km east of Lago Titicaca at an altitude of some 3995 m O.D., has at least two (vandalised) rock paintings (in red) of trees with several zoomorphs associated (Taboada Téllez 1992: Figs 13 and 14). In several cases the animals are physically attached to the branches. Some of the zoomorphs look like the ‘climbing biomorphs’ of the Desert Andes. Interestingly, the two scenes are most likely Post Colonial images as they are directly associated with depictions of Catholic churches. This combination may express the contrast between the barrenness of the Altiplano and the fertility of the land as propitiated for in the churches. Except for the example on panel PAL-142B at Palamenco (depicting a sloth?) all other Andean examples discussed in this paper most likely depict monkeys (or - less likely - rodents like the Andean ‘vizcacha’, which is, however, primarily a rock dweller, not a tree-climber). The fact that many ‘climbing biomorphs’ have a clearly spiral-like tail and seem to be ‘climbing’ phytomorphs argues in favour of the monkey-interpretation, even for areas that do not provide the natural habitat of any type of monkey. Yet, petroglyphs of monkeys in Desert Andes rock art occur as far south as the rock art site at the Pampa Vizcachilla in the Atacama Desert. This large rock art complex is located 1800 km SE of Palamenco and at 3122 m O.D., more than 200 km inland and 300 km east of the lowlands of South America, where monkeys are more likely to live. But also on the other side of the Andean watershed, near Antofagasta de la Sierra, located about 2300 km SE of Palamenco, at 3720 m O.D., 330 km inland and 170 km east of the lowlands of South America, petroglyphs of monkeys have been recorded. One petroglyph of a laterally depicted monkey has a frontally depicted head with dots for eyes. It thus is facing the observer and simultaneously the sky as it is found on a large horizontal outcrop surface. All those desert and high mountain sites are most unlikely to have ever seen monkeys in their natural habitat. As already stated in this paper, there is no evidence about the exact dating of the Palamenco ‘climbing biomorphs’. The only certainty about the dating of Palamenco petroglyphs is that a part of its repertoire has been manufactured during the Formative Period and possibly during the much earlier Preceramic Period (altogether covering a time span of about 4000 years). This means that petroglyphs at Palamenco may be up to 6000 years old or even older. However, it is also possible and probable that several images at Palamenco are much later and date from the Early Intermediate Period (for instance manufactured by the Salinar or Moche cultures) to the Late Intermediate Period (for instance the Chimú culture). Indeed, the Moche sporadically manufactured fine-line paintings on ceramics depicting complex trees with apparently monkeys climbing the branches, or plants (reed?) with birds climbing the stems. But I have no knowledge of definite Moche rock art depicting phytomorphs directly associated with biomorphs, although the possible ‘choclo’ petroglyph with the bird on top from Cajamarca Site 2 just possibly is of Moche origin (Van Hoek 2011b: 41). More precisely, I do not know of any rock art image in the Desert Andes depicting complex trees with biomorphs. An Andean exception concerns the Chirapaca rock paintings, which are found, however, far to the east of the Desert Andes. Another reason to suggest Recuay, Moche and/or Chimú origins for the ‘climbing biomorph’ theme is the fact that Recuay, Moche and Chimú iconography more frequently depict biomorphs (also monkeys) in a very typical position. To illustrate the resemblance between such biomorphs on artefacts and certain ‘climbing biomorphs’ petroglyphs, I illustrate two opposing monkeys on a gold Chimú mask (stored in the Larco Hoyle Museum in Lima, Peru). Although a pole is lacking and they are not actually facing each other, the ensemble (framed in Figure 35) resembles the petroglyph on boulder PAL-079 at Palamenco very much. Figure 35: Chimú mask stored in the Larco Hoyle Museum in Lima, Peru. Also confirming this possible Moche-Chimú relationship are the several petroglyphs of facing biomorphs (monkeys?) in the same position that do not have a central pole. At Lambayeque Site 1 is a prominent outcrop stack, Lambayeque Site 1 - Panel t-560. 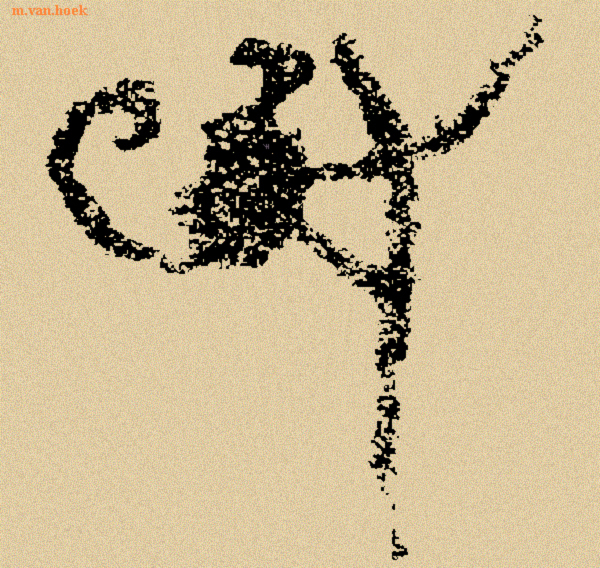 On its vertical face are two petroglyphs of outlined biomorphs in a vertical, rotated position (Van Hoek 2012a: 179 and 181). Interestingly, although there is no pole in between them, the biomorphs - most likely depicting ‘monkeys’- are facing each other, while their legs are touching each other (as if climbing?). Another rock art site in the same valley includes a very large boulder that is decorated on several sides. On the almost inaccessible top of the west facing panel (Lambayeque Site 2 - Panel 009B) is an ensemble of two facing biomorphs with a curled tail and again with their short legs touching (Van Hoek 2012a: 196). Their bodies and heads are drawn in outline. They both have been drawn in a vertical, rotated position, yet again without a central pole and thus the configuration is much similar to the example at Lambayeque Site 1 - Panel t-560. A similar ensemble of two facing ‘monkeys’ is found at the ‘Piedra de los Monos’ at Sapuyes, Nariño, Colombia. No ‘climbing biomorphs’ have been recorded by me during my extensive surveys of La Libertad 4 Site, 100 km NW of Palamenco. However, one boulder, La Libertad Site 4 - Boulder 2-013, has two facing biomorphs in a vertical position; the legs almost touching (Figure 36). They have a curled tail each and thus may depict ‘monkeys’ or ‘vizcachas’. The ensemble looks somewhat like PAL-079, even though the pole is absent. Figure 36: Detail of two petroglyphs on La Libertad Site 4 - Boulder 2-013. It proves that many examples are located in the coastal strip of northern Peru and for that reason they indeed could be for instance Moche or Chimú of origin. However, petroglyphs of facing biomorphs have also been reported outside the Moche or Chimú influence sphere, like the examples from El Potrero near the border with Ecuador (Hostnig 2003: 86). But also at Tacna Site 1, an area where Moche or Chimú influence never reached, at least one ensemble of ‘climbing biomorphs’ has been reported that face each other, while ‘climbing’ a shared pole. Moreover, also Boulder Tacna Site 1 - Boulder M-112 features two sets of two vertically orientated ‘monkeys’ that face each other, while in both cases any pole is lacking. 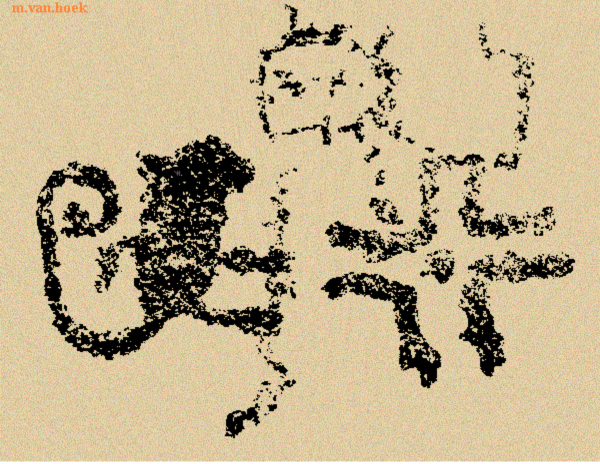 On a boulder at Arequipa Site 1 - Boulder Dx-007 is a petroglyph of two linearly-drawn zoomorphs (foxes or dogs?) in a vertical position that are facing (or fighting?) each other (Van Hoek 2012b: Fig. 289). In northern Chile there are two sets of petroglyphs at Chile Site 2 (on two different panels), each depicting two biomorphs in a vertical position facing each other (Figure 37). Figure 37: Petroglyphs from Chile Site 2. Photograph © by Maarten van Hoek. In conclusion, it proves that the Andean themes of the ‘climbing biomorph’ and the ‘facing biomorphs’ are widespread and cannot exclusively be linked to one culture. In fact many Andean cultures - from earliest time on - have used the theme of opposing biomorphs. Rock art images of ‘Climbing biomorphs’ occur in many parts of the world. Surprisingly however, examples prove to be very rare and often are of a much different character compared to the Andean examples. Yet, it will be interesting to discuss and compare a number of non-Andean examples in order to possibly explain the theme of the Andean ‘climbing biomorphs’. In the south of Africa, San rock art more often includes depictions of phytomorphs than in northern African or Andean rock art; also when it concerns phytomorphs directly associated with biomorphs. Although examples occur in several parts of southern Africa, especially in the rock art of the Mapoto Hills, Zimbabwe, houses some most interesting examples (Siyakha Mguni 2002, 2009). 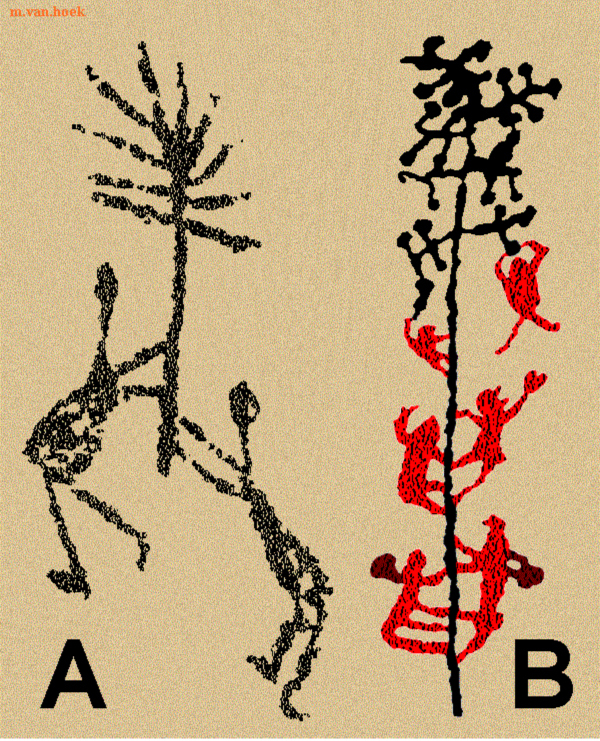 Interestingly, he illustrates two examples of San rock paintings involving ‘climbing biomorphs’. 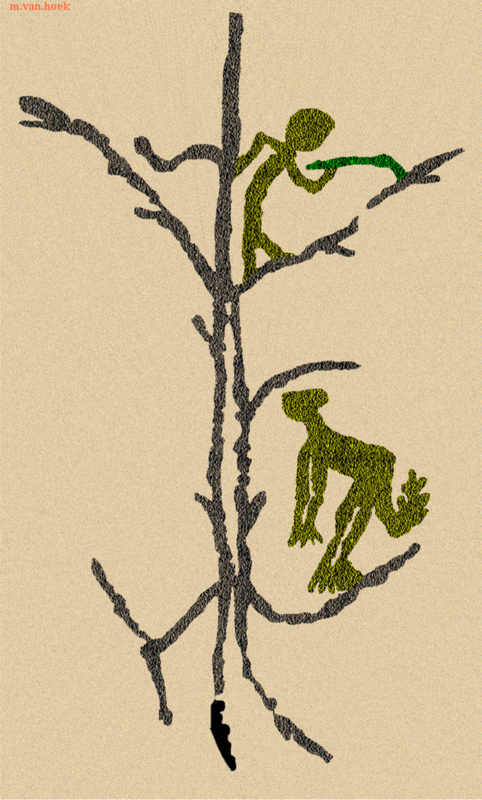 According to Siyakha Mguni one rock painting illustrates the connection between San shamans and trees, which is symbolised by two short-tailed therianthropes that are climbing on one of the two branches of a much stylised tree (Figure 38). It is interesting to compare this forked ‘tree’ with the forked poles from Palamenco. Mungi regards trees and plants as the ‘axis mundi’ of the San cosmology. 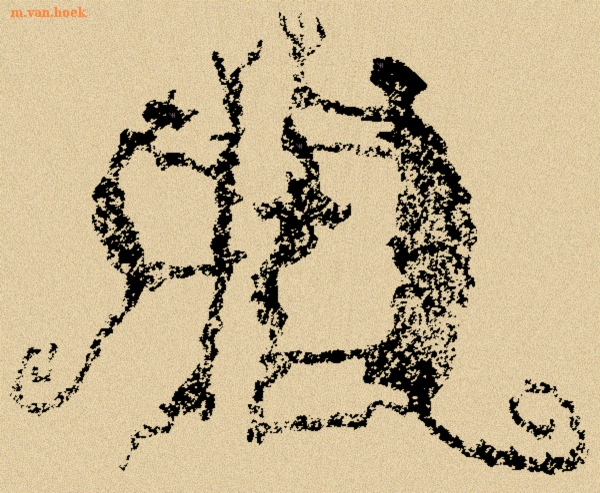 Another rock painting depicts a human figure climbing a tree, the branches of which are superimposed by two indeterminate animals (Figure 39). He again argues that human figures and therianthropes climbing trees recall the experiences of the Hei//om shamans, who, with the help of an antelope guide accompanying them on extra-corporeal journeys, climb up a ‘Lebensbaum’ (tree of life) to enter the spirit realm. The tree is an archetypal shamanic route via which trancers enter preternatural realms (Mguni 2002: 178 - 179). Regarding San rock art Mguni (2002: 179) also speaks of ‘the threads of the sky’; the things which the trancer climbs to transcend the cosmos. The threads are sometimes described as ‘cords’ connecting the earth and heavens to assist the soul’s ascent to the sky. A rock painting from Waltondale, Zimbabwe, possibly shows such a cord with ‘climbing biomorphs’ attached, which seems to continue as a bicephalic snake; also with some ‘climbing biomorphs’ attached (Woodhouse 1989: Fig. 8). The San also use ‘ropes’, ‘cords’ or ‘threads’ that hang from the sky like spider webs to climb into God’s house (Mguni 2002: 191). San rock art paintings involving biomorphs climbing such ‘threads’ have also been recorded from the Drakensberg area of South Africa (Figure 40). 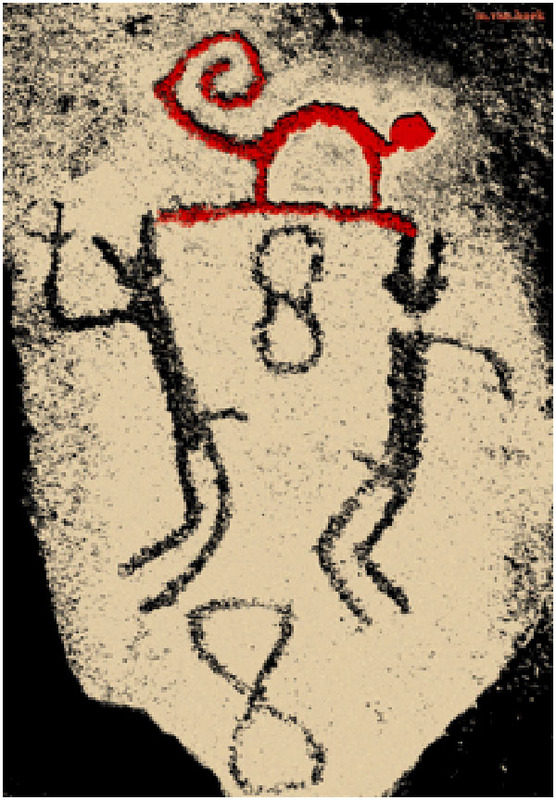 Figure 38: San rock painting from the Mapoto Hills, Zimbabwe. Drawing by Maarten van Hoek, based on a drawing by Siyakha Mguni (2002: Fig. 24). Figure 39: San rock painting from the Mapoto Hills, Zimbabwe. Drawing by Maarten van Hoek, based on a drawing by Siyakha Mguni (2002: Fig. 25). Figure 40: San rock painting from the Drakensberg area (?) of South Africa. Johannesburg, South Africa) to get informed about the location of this rock painting. Some scholars never answered; others only could tell that - possibly - it was from the Drakensberg area. One of the best known rock art panels with ‘climbing biomorphs’ occurs at Murujuga; a peninsula in Western Australia, which is better known as the Burrup Peninsula of the Dampier Archipelago. Thousands and thousands of petroglyph panels are estimated to occur in this area, but only an extremely limited number depicting ‘climbing biomorphs’ has been recorded. As, apparently, ‘climbing men’ mainly seem to have been depicted on one specific panel, that very spot (thus not the whole site of Murujuga) became famous as the ‘Climbing Men Site’. On this almost vertical rock panel there are possibly five scenes where biomorphs seem to be attached to a vertically orientated groove (three scenes from this panel are shown in isolation in Figure 41). In the same area there is at least one more boulder (located in the Deep Gorge, 4 km to the south of the ‘Climbing Men Panel’) with a scene similar to the left-hand arrangement in Figure 41 (much weathered though). Murujuga, Australia. The two arrangements are not in the correct position. Drawing by Maarten van Hoek, based on a photographs by Celeste Lawson (2007) and Robin Chapple (n.d.). These Murujuga scenes have been described as: humans in profile arranged in pairs or asymmetrically around a vertical line, anthropomorphs climbing or hanging from lines, men in sea-going vessels, images of sailors clinging to the masts of ships, human figures climbing a mast, and as human figures ascending a line (why not descending?). Fortunately Patricia Vinnicombe (2002: 18 - 19) describes those scenes not as humans but just as figures: ‘Some of these figures are associated with lines along or up which they appear to be either suspended or climbing’. The ‘Climbing Men’ panel has even been analysed - whether correctly or not - in terms of a controversial neuropsychological model that links rock art production to visual phenomena resulting from shamanistic experiences while in altered states of consciousness (Sales 1992). Despite the above mentioned interpretations, Robert Bednarik (2006a: Fig. 124; 2006b: Fig. 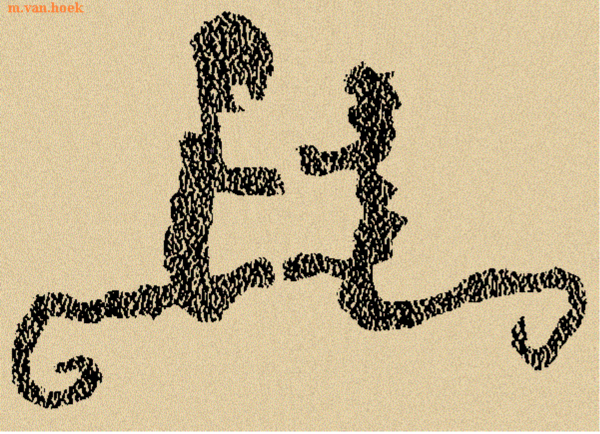 2) claims the following: ‘Their precise meaning is known to me, it certainly does not depict any “climbing men”.’. Strangely, in the same caption Bednarik also states that ‘A close-up of this panel is not presented here because some components of it are of a sacred nature and must not be viewed by the uninitiated’. Yet, in other publications Robert Bednarik contradicts himself by publishing close-up photos of the ‘Climbing Men Panel (2006b: Fig. 2; 2009: Fig. 7; and an undated publication on the internet). Has the sacred nature of the panel been abolished all of a sudden? Because initiated persons are supposed to keep their promises to the Aboriginals, Robert Bednarik does not reveal the meaning of the ‘Climbing Men’ (2006: Fig. 124). Yet, in another publication he discloses that ‘part of this composition depicts in fact a sacred ceremony’, without fortunately offering any further details (2009: Fig. 7). There is no doubt that Bednarik will have been correctly informed by an initiated Aboriginal about the ‘precise’ meaning of those scenes, but that does not necessarily mean that the Aboriginal informant was well-informed. First of all, many of the petroglyphs at Murujuga may be many thousands of years old. Caroline Bird and Sylvia Hallam (2006: Fig. 22) even suggest that ‘the oldest most weathered petroglyphs probably date to before 20.000 years ago’. Several of the arrangements of ‘climbing biomorphs’ at Murujuga seem to be very old (and others may even have been re-pecked). Secondly, selecting and then being able to exactly explain the meaning of only one specific and very rare set of images out of the more than half a million images would be an enormous heuristic achievement (and I do not underestimate the capacities in this respect of the Aboriginals). Consequently, it is still possible that Aboriginal misrepresentation of Murujuga symbols may have carried over into European interpretation. Therefore the true meaning of those rare scenes may well have been lost in time or - more likely - may have changed during the numerous oral communications. I for one have no idea what exactly the Murujuga ‘climbing men’ depict, symbolise or mean, but the ‘Climbing Men’ of Murujuga clearly illustrate the problems with interpretation and with ‘informed’ knowledge regarding ancient rock art images in general. To me it is not even certain that anthropomorphic figures are depicted at Murujuga and for that reason I prefer to speak of biomorphs. The same issues of interpretation and purported ‘informed’ knowledge relate to a rock painting at the Malarrak rock art site. This site, located within the Wellington Range, the northernmost outlier of the Arnhem Land Plateau, Northern Territory, Australia, involves a scene which is said by George Chaloupka (1996: 136) to represent two monkeys in a tree (Figure 42). based on a photograph by Paul Taçon (2013: Fig. 8.6). While Paul Taçon and Sally May (2013: 132-133) agree that the figure on a lower branch does resemble a macaque monkey in many regards, they reject the monkey interpretation for the figure on the upper branch. In their opinion it clearly represents a human-like figure that holds what appears to be a curved object that has both a boomerang-like and a kris-like shape (a kris is an Indonesian knife). Paul Taçon and Sally May continue to say that - although the lower figure is macaque-like in form and many people visiting the site interpret it this way - it is possible that the artist depicted some other animal. A photograph of this painting was shown to an Aboriginal elder, the late Jimmy Galareya Namarnyilk, who immediately identified it as ‘djabbo’, the northern spotted quoll. He interpreted the composition as a hunting scene with a Bininj (an Aboriginal person) in the tree above. Although Paul Taçon and Sally May agree that the painted image does have a quoll-like bushy tail, they also argue that the rounded head/face looks macaque-like. However, after having seen several photos of the northern long-tailed quoll, I doubt very much if the quoll interpretation is correct. 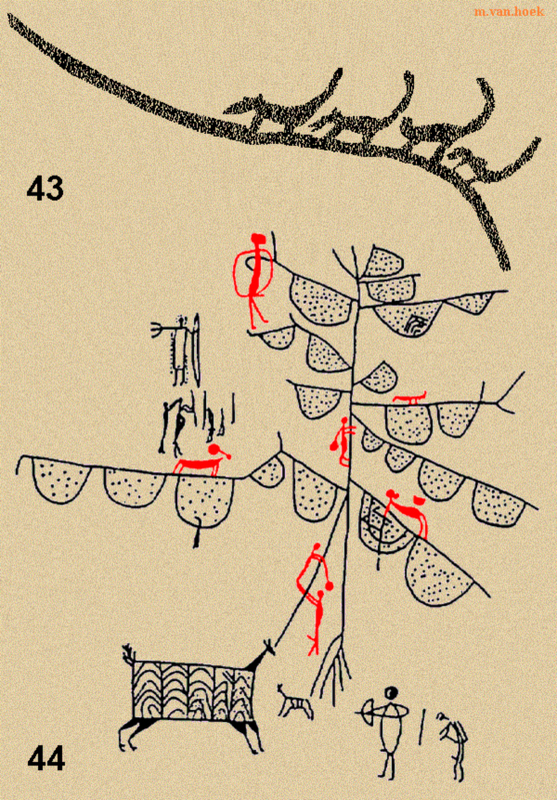 Rock paintings from Ganeshghati (Figure 44) and Rajat Prapat, India, depict biomorphs climbing trees (Crane 1999: Figs 10.2a and 10.2d). The scenes have been interpreted as people collecting the honey from the nests of the giant bee that usually are found attached to the branches of trees. Other honey-collecting scenes are known from other places, like the very old rock painting from the Cueva de la Araña, Spain and the rock painting in the Eland Cave in southern Africa. Figure 43: Rock painting (detail) from Karikkiyur, India. Drawing by Maarten van Hoek, based on a photograph by Gandhirajan in Subramanian (2007). Figure 44: Rock painting from Ganeshghati, India. Drawing by Maarten van Hoek, based on a drawing by Ethel Eva Crane (2013: Fig. 10.2a). At the Shalabolino rock art site on the river Tuba, southern Siberia, hundreds of petroglyphs have been recorded, 22 of them representing ‘bears’ (McNeil 2003: 53). However, only one of those petroglyphs depicts a ‘bear climbing a tree’ (Figure 45). Lynda McNeil suggests that this scene ‘recalls the Ket and Evenk(i) bear totemic matriclan ancestor making its journey of ascent to the upper world via the clan tree’ (2001: 307). As far as I could check, this is the only ‘climbing bear’ rock art image in Siberia, although a second bear petroglyph at Shalabolino - standing upright - may be directly associated with a natural fissure in the rock wall that according to Lynda McNeil (2001: 307) ‘resembles a tree-trunk’. This fissure is also considered by her as a portal (2008: 77). 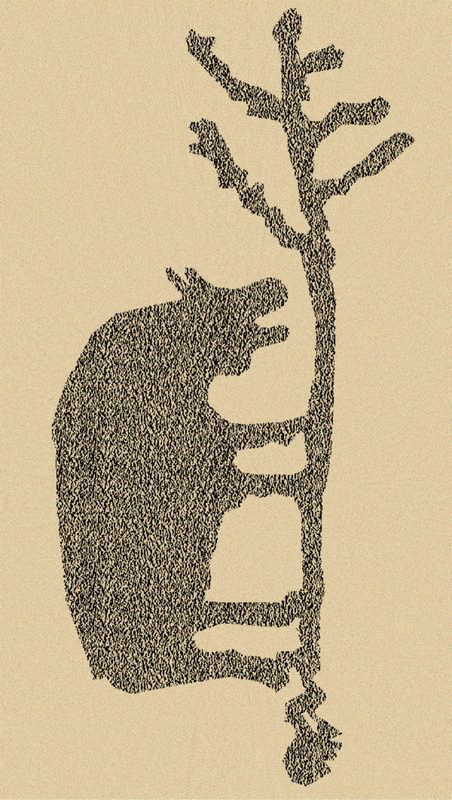 Figure 45: The Shalabolino ‘climbing bear’ petroglyph. Drawing by Maarten van Hoek, based on a photo from E. Miklashevich (in McNeil 2001: Fig. 7). Interestingly, Lynda McNeil (2001) compares the Shalabolino ‘climbing bear’ with petroglyphs from the Shavano Valley in western Colorado in the Rocky Mountains of the USA. It concerns Shavano Panel 5MN5 that clearly contains a mixture of older and newer petroglyphs (Figure 46). The oldest layer is said to date from the Late Archaic period (500 B.C. to A.D. 500). A second set of images is protohistoric Ute (A.D. 1500 to 1700) and is said to represent the mythological origins of the Bear Dance. In this latter arrangement, the rock crack is supposed to represent a cave (portal) from which ‘bear’ has emerged in the spring. Pecked dots coming out of the crack lead to ‘bear’ standing on his hind legs scratching on a tree. A more recent set is historic Ute (1800s) and includes a depiction of a horse, a tree and another bear. Figure 46: The Shavano ‘Climbing Bears’ petroglyphs. Drawing by Maarten van Hoek, based on a photo by Lynda McNeil (2001: Fig. 9). Lynda McNeil (2001: 308, my additions between ) interprets the bear petroglyphs at Shavano as follows: ‘While the first two [lower] bears appear to be in the process of ascending the clan tree, the third [upper] bear (perhaps cosmic or spirit) appears to have arrived at the end of its path or journey in the spirit realm. Remarkably, of the thousands and thousands of rock art sites in Northern America, the Shavano panel is - as far as I know - the only panel depicting ‘climbing bears’. However, Sally Cole (2001: 238) reports that the Shavano theme is ‘duplicated’ in a painting, dated 1900, of the Ute Bear Dance legend by an Uncompahgre Ute Indian. But without an illustration or further information it is impossible to say whether this 1900-scene also involves the ‘climbing bear’ theme. Another scene in the Uncompahgre area in Colorado shows the petroglyph of an anthropomorphic figure attached to (climbing?) a long, vertical line that seems to end in an arrow or spear ‘piercing’ (though superimposing) a bighorn sheep (Cole 2001: Fig. 32). Although bear petroglyphs similarly rotated in a 90 degrees position (a perfectly natural position for bears) have been reported from other sites, for example in Nine Mile Canyon, Utah, no ‘climbing biomorphs’ are known from this extensive site. It proves that the theme of the ‘climbing biomorph’ is extremely rare in Southwest rock art. As far as I know the only other area in the Southwest of the USA involving ‘climbing biomorphs’ is the Galisteo Basin in New Mexico. One panel depicts three, possibly four ‘skunks’ that are climbing diagonally arranged straight poles without branches (one example is rather faint and less perfectly executed), while a fifth ‘skunk’ is mounting one of the ‘climbing skunks’ (Schaafsma 1992: Fig. 150). Another petroglyph panel in the same area may have one ‘climbing biomorph’; possibly a ‘skunk’ as well (Schaafsma 1992: Fig. 141). In a small recess of the deep limestone cave of Hoyo de Sanabe near Cotuí in the Dominican Republic are at least three rock paintings of biomorphs that are attached to a vertical line. The largest figure measures more than a meter in length (Figure 47). These figures have been interpreted as humans descending into the cave via a rope. The cave may be interpreted as the entrance for a shaman, and entering the cave may symbolise the shaman entering a deep trance. In the same cave is also a rock painting of two biomorphs hanging from a horizontally drawn line (a branch? ), as well as two or three birds walking on a horizontal line. Figure 47: Rock painting from Hoyo de Sanabe, Dominican Republic. Drawing by Maarten van Hoek, based on a photograph by Daniel Duvall (n.d.). Figure 48: Rock painting from Toca da Baixa Verde, Brazil. Drawing by Maarten van Hoek, based on a drawing by André Prous (1991: Fig. 90f). 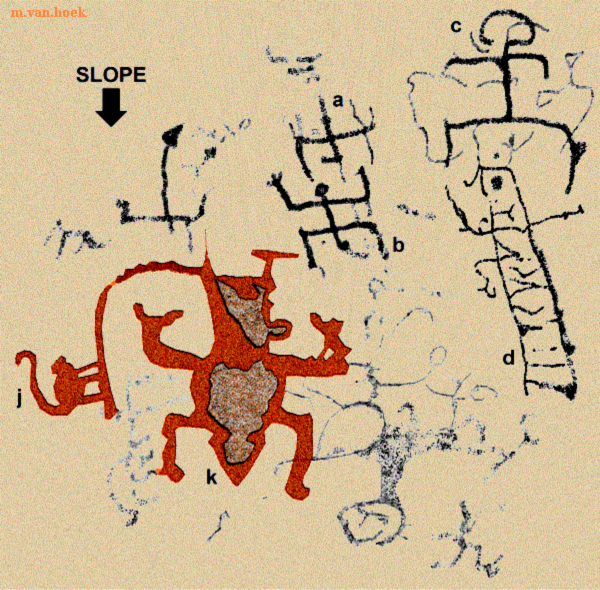 Also in South America and outside the Andes ‘climbing biomorphs’ have been recorded, especially in the rock art of NE Brazil (see also Figure 1B). A rock painting at Toca da Baixa Verde, Serra da Capivara, Piauí, depicts two tree-like designs with at least one small biomorph physically attached to one of the branches (Figure 48). Some similarly small biomorphs seem to be ‘falling from the trees’ and larger biomorphs with raised arms near the base of the tree seem to be ‘catching the offspring’ (my interpretations). As tree-related scenes in the rock art of NE Brazil are often said to be fertility related, also this scene may therefore symbolise a fertility ritual. This general fertility interpretation seems to be confirmed by other authors (Kestering et al. 2012). Michel Justamand who illustrates rock paintings of scenes involving humans and trees (cena do ritual da árvore) at Toca do Pedra do Uma (2007: Figs 25 and 70) and at Toca da Extrema (2007: Fig. 44), also in the NE of Brazil, also suggests that those rituals are concerned with fertility (2007: 195). 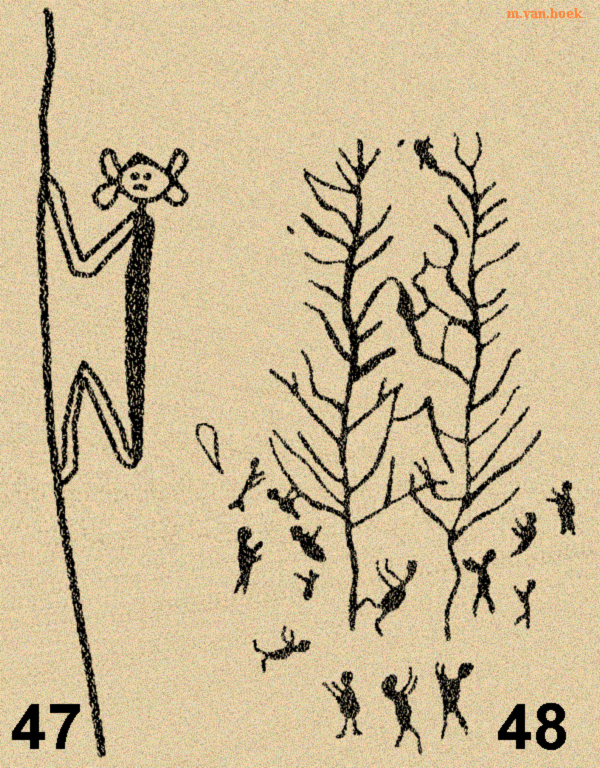 A more enigmatic scene appears at the rock painting site of Tiririca, where two possible trees seem to be connected by a horizontal line near the top, while several biomorphs seem to represent ‘climbing zoomorphs’ (Figure 50). 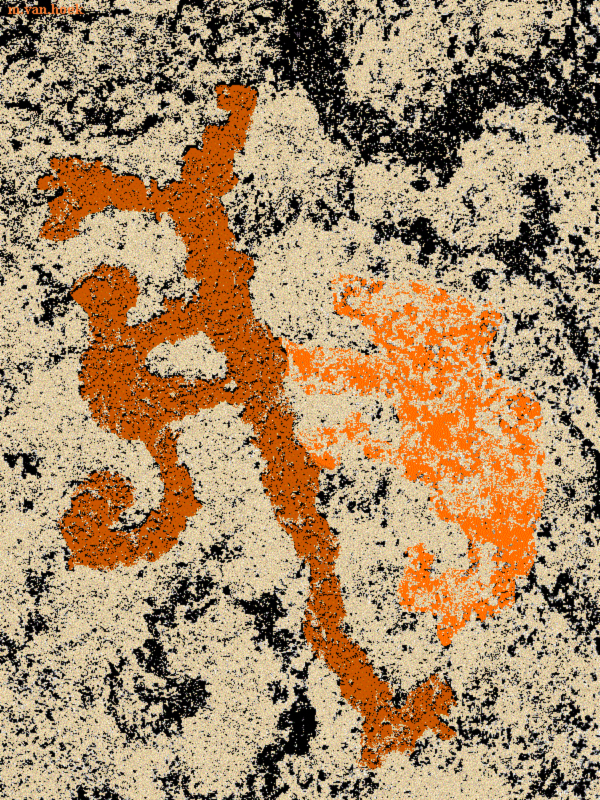 Figure 49: Rock painting from Tiririca, Brazil. Drawing by Maarten van Hoek, based on a drawing by Campelo Magalhães (2011: 190: Plate 183). From this survey it proves that ‘climbing biomorphs’ are exceptional in rock art. For instance, we have seen that only up to 33 (possible) examples (when counting each biomorph individually and not counting the unconnected biomorphs that are however in the ‘climbing’ position) of the probably more than a half a million petroglyphs that are estimated to occur in the enormous concentration of petroglyphs at Murujuga, Australia, may depict ‘climbing biomorphs’. Moreover, the 33 examples are concentrated on just two (?) panels: 21 examples attached to five lines on the ‘Climbing Men Panel’, and possibly 12 examples attached on both sides to only one groove on a second, much weathered panel at Deep Gorge, 4 km further south. Although Robert Bednarik states that that ‘part of this composition depicts in fact a sacred ceremony’, one may wonder why such a sacred ceremony - which must have been an important ritual - has only been depicted on two (?) panels in this large area. The same goes for the suggestion by Lynda McNeil that the ‘climbing bear’ scene at Shalabolino, Siberia, may depict ‘the Ket and Evenk(i) bear totemic matriclan ancestor making its journey of ascent to the upper world via the clan tree’. To me this scene seems to symbolise an important event and thus I wonder why - so far - only one panel has been reported depicting this event. That is, why only once in Siberia? The fact that there is an analogous scene at Shavano, North America, does in my opinion not imply that the Shalabolino bear ritual - depicted only once! - travelled more than 11.000 km to North America, where it also appears again, but once more only once. Likewise it would be - in my opinion - too far fetched as well to suggest that the Palamenco ‘climbing biomorph’ scenes derive from (bear-related?) rituals that originated in North America. My point is that it is extremely hazardous to apply informed knowledge - especially when derived from non-rock art sources - onto rock art images without having been informed directly by the manufacturer of the rock art. And even then, one may have been misinformed (on purpose!?) by the manufacturer. Although statistically more or less the same, the situation at Palamenco is different to Murujuga. Indeed, there are only 25 possible images of the ‘climbing biomorph’ at this Andean site; which is a rather low number, in the context of the hundreds of images at Palamenco. But in the Andean context it is an exceptionally high number. The discrepancy is however that there is not available a single piece of informed knowledge about any of the images at Palamenco (while informed knowledge seems to exist at Murujuga). First of all, in the Andes there never existed a system of writing in Pre-Columbian times and in Peru oral accounts only started to be recorded in writing after A.D. 1528. Furthermore, I am not aware of any Post Colonial account regarding Palamenco, let alone of one specific image at that site. And even if such account would surface in the future, it would - in my opinion - never be reliable. Therefore, one can only guess what rationale explains the (excess of) ‘climbing biomorphs’ at Palamenco. One can only speculate about the meaning of the theme of the ‘climbing biomorph’ at this site and all other sites in the Desert Andes. Yet it is interesting to review some possible meanings of the Andean ‘climbing biomorphs’. It is certain the theme of the Andean ‘climbing biomorph’ communicates some kind of message. Although we do not even know whether those Andean biomorphs are actually climbing, it remains a possibility that only realistic scenes of monkeys climbing trees have been depicted, albeit in a rather stylised manner. This may be compared with the apparently realistic depictions of people collecting honey, for instance at Ganeshghati, India (see Figure 44), and in the Cueva de la Araña in the Iberian Peninsula. 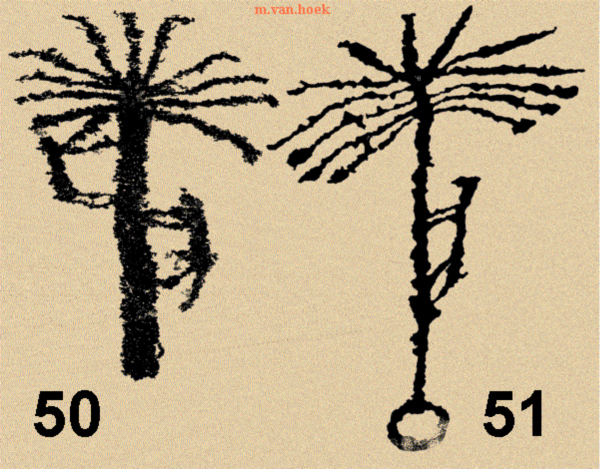 Several petroglyphs from the Arabian Peninsula depict people climbing palm trees, allegedly in order to collect dates, for instance at Umm Sanman Site 1 (Figure 50) and at Jebel Yateb where roots seem to have been indicated by circles (Figure 51). And yet, all those seemingly realistic images may have a different, deeper meaning. 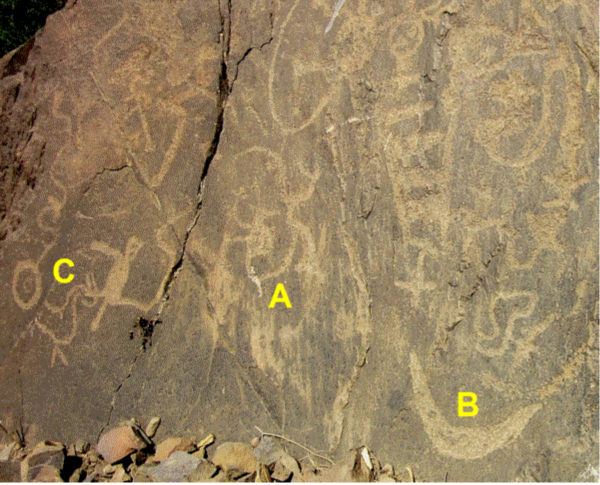 Figure 50: Petroglyph from Umm Sanman - Site 1, Arabian Peninsula. Drawing by Maarten van Hoek, based on a photograph by Green Arabia (2014). Figure 51: Petroglyph from Jebel Yateb, Arabian Peninsula. Drawing by Maarten van Hoek, based on a photograph by Richard Bryant (2014). It is also possible that the Palamenco ‘climbing biomorph’ depicts a sacred animal and that the scenes of climbing indeed symbolised a (shamanic?) ascent to the Upper World, comparable with the path or journey in the spirit realm suggested for the Shavano (Ute) and Shalabolino (Ket and Evenki) bear petroglyphs. In the Ute religion of North America it is held that trees allow communication between the upper- and underworlds. Shamanism was and still is practiced in many parts of the Desert Andes and although it is completely obscure if the theme of the ‘climbing biomorph’ at Palamenco is indeed in any way shaman-related, this possibility cannot be ruled out completely. There are significant analogies in other parts of the world. Indeed, Siyakha Mguni claims that the tree (in southern African rock art) is an archetypal shamanic route via which trancers enter preternatural realms (Mungi 2002: 197). But again one has to be cautious. 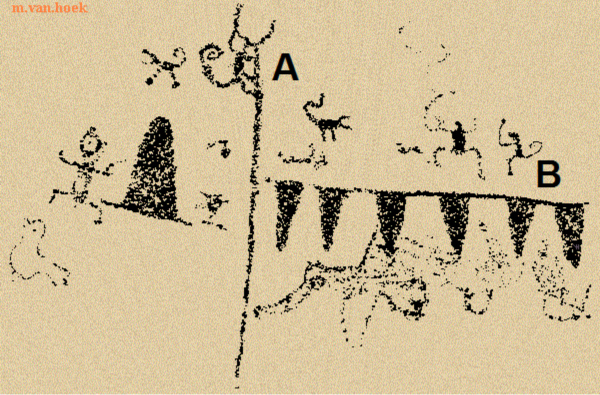 For example, also in San rock art ‘climbing biomorphs’ may have a completely different and still unexplainable meaning, like the small ‘climbing biomorphs’ in a rock painting from Manazwa, Zimbabwe (Garlake 1987: Fig. 11), that seem to ascend and descend a composite zigzag line emerging from the genital area of an enigmatic (female?) anthropomorphic figure (a menstrual flow?). Therefore, any comparison of the Andean ‘climbing biomorph’ with San shamans climbing up a ‘Lebensbaum’ (Tree of Life) to enter the spirit realm, as has been suggested by Siyakha Mguni for certain southern African rock art images, is unreliable. 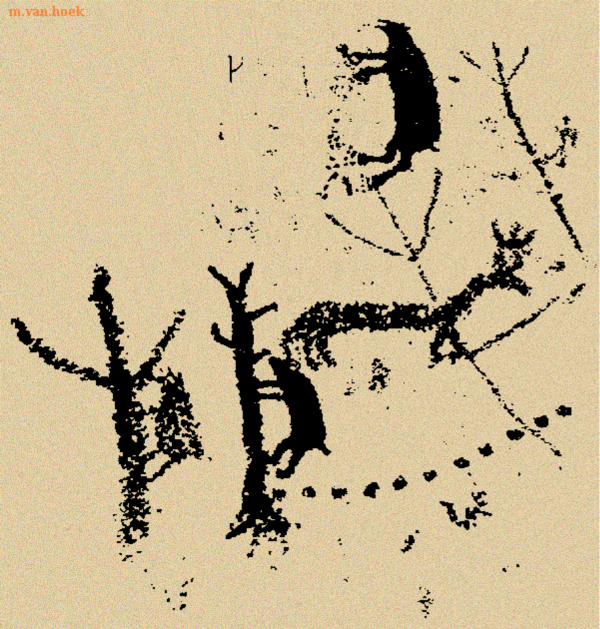 Yet, also in Latin America rock art images have been interpreted as the Tree of Life (Árbol del Mundo or Árbol Cósmico), as has been suggested for a phytomorphic petroglyph from the Department of Estelí, Nicaragua (Hildeberto María 1965: 177; Fig. 12). The more specific scene of two ‘climbing biomorphs’ sharing one central pole and (possibly) facing each other, may convey the same symbolism as is illustrated on the ceramic from Pasto, called ‘El plato de la Creación’, now in the Museo Conavi, Columbia. The ceramic depicts two opposing zoomorphs with a curled tail (Santacruz Moncayo 2010: Fig. 2). The scene on the ceramic is said to narrate of two witches (brujas) or shamans that fought each other in order to decide which people had gained the right to stay in the area. However, if indeed the ‘climbing biomorphs’ in Desert Andes rock art depict monkeys (disregarding some possible exceptions), this specific theme may also express fertility-related symbolism. Importantly, according to Lautaro Núñez and Victoria Castro (2011) the image of the monkey in (the rock art of) northern Chile seems to have been fertility related. Moreover, according to Julio César Fernández Alvarado (2014), the monkey was not only kept as a (high-status) ‘pet’, but was a symbol for agricultural fertility in ancient (northern) Peru as well. Yet, even if the ‘climbing biomorph’ stands for agricultural fertility symbolism, the excess of images of ‘climbing biomorphs’ at Palamenco is enigmatic. First of all Palamenco is found at a very isolated desert location. Secondly, the nearby valley of the Lacramarca River is not really suitable for agriculture because of its rocky character and because of the rather limited area of land suitable for agriculture. The fertile Santa Valley is too far west to explain the excess of ‘climbing biomorphs’ petroglyphs at Palamenco. In conclusion one can certainly state that the scene of the ‘climbing biomorph’ constitutes a very specific and recognisable graphical theme in Desert Andes rock art, especially as - in general - Andean rock art is almost bereft of phytomorphic imagery. Moreover, images of ‘climbing biomorphs’ are found in relatively very small numbers, but are distributed across a very large area as they occur in the coastal strip from Lambayeque in northern Peru to northern Chile; a distance of more than 1800 km. Also remarkable is that there are only two major concentrations (and a few isolated examples). One group occurs in Ancash and one - 1350 km further SE - is found in Tacna. Surprisingly, both sites seem to be graphically and possibly symbolically connected. Unfortunately one can only speculate regarding the meaning(s) of the Andean ‘climbing biomorphs’ as informed knowledge about the Andean ‘climbing biomorphs’ will never surface. I would like to thank Rainer Hostnig (Peru), Renato Aguirre Bianchi (Chile) and Carol Patterson (USA) for sharing many photographs from their private collections with me. Please be aware that any URL included in this paper (functional as per September 2015) may be broken or even hacked. Please notify me if any broken link occurs. Bednarik, R. G. 2006a. Australian Apocalypse. The story of Australia’s greatest cultural monument. Occasional AURA Publication No. 14. Melbourne, Australia. Bednarik, R. G. 2006b. Editorial. Rock Art Research. Vol. 23-2; pp. 148 - 152. Melbourne, Australia. Bednarik, R. G. 2009. The Dampier Rock Art Precinct, Western Australia. In: L’art parietal: conservation mise en valeur communication. Edited by the Société des Amis du Musée National de Préhistoire et de la Recherche Archéologique (SAMRA). pp. 187 - 198. Lez Eyzies, France. Bird, C. and S. J. Hallam. 2006. A review of archaeology and rock art in the Dampier Archipelago. Report prepared for the National Trust of Australia (WA). Bracamonte Lévano, E. and C. A. Pasapera Rojas. 2008a. Los petroglifos de Cafetal de Tolón y su contexto cultural en el valle bajo del Jequetepeque. Paper presented at the III Simposio Nacional de Arte Rupestre. Huaraz, Perú. Campelo Magalhães, S. M. 2011. A arte rupestre do centro-norte do Piauí: Indícios de narrativas ic?nicas. Thesis. Niteroi, Brasil. Castillo Benites, D. S. 2009. Petroglifos del Distrito de Simbal, valle de Moche. Revista del Museo de Arqueología, Antropología e Historia. No 11; pp. 145 - 158. Trujillo, Peru. Chaloupka, G. 1996. ‘Praus in Marege: Makassan subjects in Aboriginal rock art in east Arnhem Land, Northern Territory, Australia’. Anthropologie. Vol. 34; pp. 131 - 42. Cole, S. J. 2001. Legacy on stone. Rock art of the Colorado Plateau and Four Corners Region. Boulder, Colorado. Crane, E. E. 1999. The World History of Beekeeping and Honey Hunting. New York. Fernández Alvarado, J. C. 2014. El mono: Símbolo de la fertilidad en el antiguo Perú. Revista Tzhoecoen. VOL. 6 / No 1; pp. 257 - 273. Chiclayo, Perú. Garlake, P. S. 1987. Structure and meaning in the prehistoric rock art of Zimbabwe. Indiana University. Bloomington. Indiana. Gordillo Begazo, J. 1996. Miculla. Petroglifos: La Mágia de los Signos. Tacna, Peru. Hancock, G. 2005. Supernatural: Meetings with the Ancient Teachers of Mankind. London. Hildeberto María, H. 1965. Estas piedras hablan. Estudio preliminar del arte rupestre en Nicaragua. University of Texas. Hostnig, R. 2003. Arte rupestre del Perú. Inventario Nacional. CONCYTEC, Lima, Perú. Justamand, M. 2007. O Brasil desconhecido: as pinturas rupestres de São Raimundo Nonatu - Piauí. Thesis. São Paulo, Brasil. Kestering, C., R. Alves, S. Lacerda de Lima Filho and S. G. A. Martinelli. 2012. Pinturas Rupestres da Tradição Nordeste em Sento Sé - BA. In: Arqueologia. Lachaud, S. 2014. Arboriformes et anthropomorphes: réfexions sur quelques gravures du Sud-Maroc. Cahiers de l’AARS. Vol. 17, pp. 131 - 150. McNeil, L. D. 2001. Climbing Bear, Spirit-Helper: Companion Petroglyphs at Shalabolino (Siberia) and Shavano (Colorado, USA). American Indian Rock Art. Vol. 27; pp. 301 - 312. McNeil, L. D. 2003. Seasonal revival rites and rock art of Minusinsk Basin colonizers, Siberia. Utah Rock Art. Vol. 23; pp. 45 - 59. McNeil, L. 2008. Recurrence of Bear Restoration Symbolism: Minusinsk Basin Evenki and Basin-Plateau Ute. Journal of Cognition and Culture. Vol. 8; pp. 71 - 98. Leiden. Mguni, S. 2002. Continuity and change in San belief and ritual: some aspects of the enigmatic ‘formling’ and tree motifs from Matopo Hills rock art, Zimbabwe. MA Thesis submitted to the Faculty of Arts, University of the Witwatersrand, Johannesburg. Mguni, S. 2009. Natural and Supernatural Convergences. Trees in Southern African Rock Art. Current Anthropology. Vol. 50, No. 1; pp. 139 - 148. Núñez Jiménez, A. 1986. Petroglifos del Perú. Panorama mundial del arte rupestre. 2da. Ed. PNUD-UNESCO. Proyecto Regional de Patrimonio Cultural y Desarrollo, La Habana. Nuñez, L. and V. Castro. 2011. ¡Caiatunar, caiatunar! : Pervivencia de ritos de fertilidad prehispánica en la clandestinidad del Loa (norte de Chile). Estudios atacameños. Vol. no.42; pp. 153-172. San Pedro de Atacama, Chile. Pessis, A-M. and N. Guidon. 2009. Dating rock art paintings in Serra de Capivara National Park. Combined archaeometric techniques. Adoranten 2009; pp. 49 - 59. Underslös, Sweden. Pimentel, V. 1986. Petroglifos en el Valle Medio y Bajo de Jequepeteque, Norte del Perú. Bonn, Alemania. Verlag C. H. Beck, München. Prous, A. 1991: A Arte Rupestre Brasileira. In: Arqueologia Brasileira. Chapter XIV. Editora Universidade de Brasília. Brasília, Brasil. Rocchietti, A. M. 2012. El Pájaro de Simbal (Valle de Moche, Perú). A?TI - Revista del Centro de Investigaciones Precolombinas. Vol. 11; pp. 5 - 14. Buenos Aires, Argentina. Sales, K. 1992. Ascent to sky: a shamanic initiatory engraving from the Burrup Peninsula, northwest Western Australia. Archaeology in Oceania. Vol. 27 (1); pp. 22 - 36. Santacruz Moncayo, H. L. 2010: Los Magos y/o Chamanes en los Pasto. El Chispas y el Guamgas. Santiago de Cali, Columbia. Schaafsma, P. 1992. Rock art in New Mexico. Museum of New Mexico Press. Santa Fe. Subramanian, T. S. 2007. The discovery of rock art, dating back to 2000 B.C., in Tamil Nadu offers a peek into history. Internet publication in Frontline. Vol. 24, Issue 12. Taboada Téllez, F. 1992. El arte rupestre inígena de Chirapaca, Depto. de La Paz, Bolivia. In: Arte Rupestre Colonial y Republicano de Bolivia y paises vecinos. Ed. Roy Querejazu Lewis. Contribuciones al Estudio del Arte Rupestre Sudamericano. Vol. No. 3; pp. 111 - 167. SIARB. La Paz, Bolivia. Taçon, P. S. C. and S. K. May. 2013. Rock art evidence for Macassan - Aboriginal contact in northwestern Arnhem Land. In: Macassan History and Heritage; Journeys, Encounters and Influences. Edited by Marshall Clark and Sally K. May. Chapter 8; pp. 127 - 139. The Australian National University, Canberra, Australia. Van Hoek, M. 2005. Biomorphs ‘playing a wind instrument’ in Andean rock art. Rock Art Research, Vol. 22-1; pp. 23 - 34. Melbourne, Australia. Van Hoek, M. 2011a. The Chavín Controversy - Rock Art from the Andean Formative Period. Oisterwijk, The Netherlands. Van Hoek, M. 2011b. Petroglyphs of Peru - Following the Footsteps of Antonio Núñez Jiménez. Oisterwijk, The Netherlands. Van Hoek, M. 2012a. Cerro Mulato: Rock Art of the Reque-Chancay Drainage, Peru. Oisterwijk, The Netherlands. Van Hoek, M. 2012b. Rumimantam Llaqllasaq Wirpuykita: The ‘Cycle of Life’ in the Rock Art of the Desert Andes. Oisterwijk, The Netherlands. Vinnicombe, P. 2002. Petroglyphs of the Dampier Archipelago: background to development and descriptive analysis. Rock Art Research. Vol. 19.1; pp. 3 - 27. Melbourne, Australia. Woodhouse, H. C. 1989. 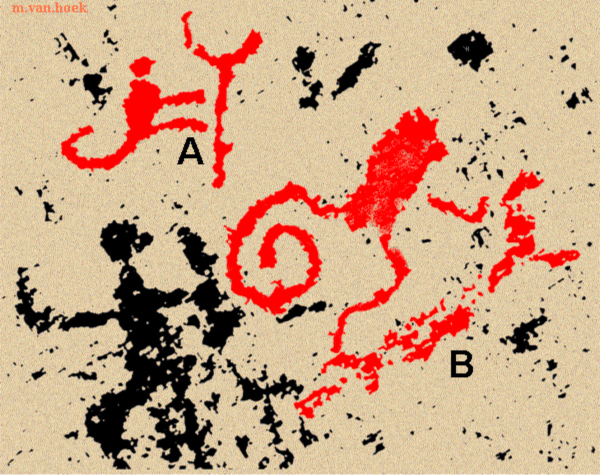 Motivation and the Rain Animal in the rock art of southern Africa. Suid-Afrikaanse Tydskrif vir Kunsgeskiedenis. Vol. 4 (2&3); pp. 15 - 25.